Quick color study of a model, Alex. 12x16 inches, oil on canvas. Painted in November of 2016. 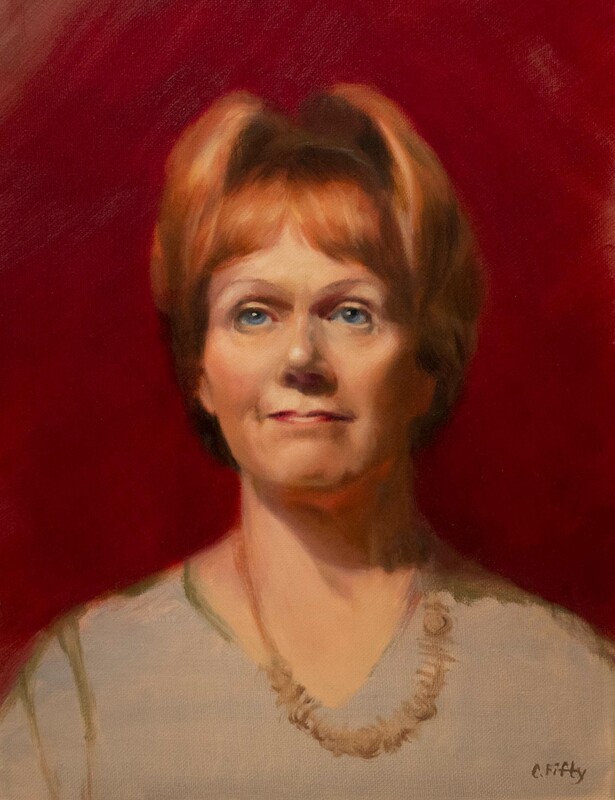 This is a formal oil portrait on canvas of my neighbor, Fran. 20x24 inches. 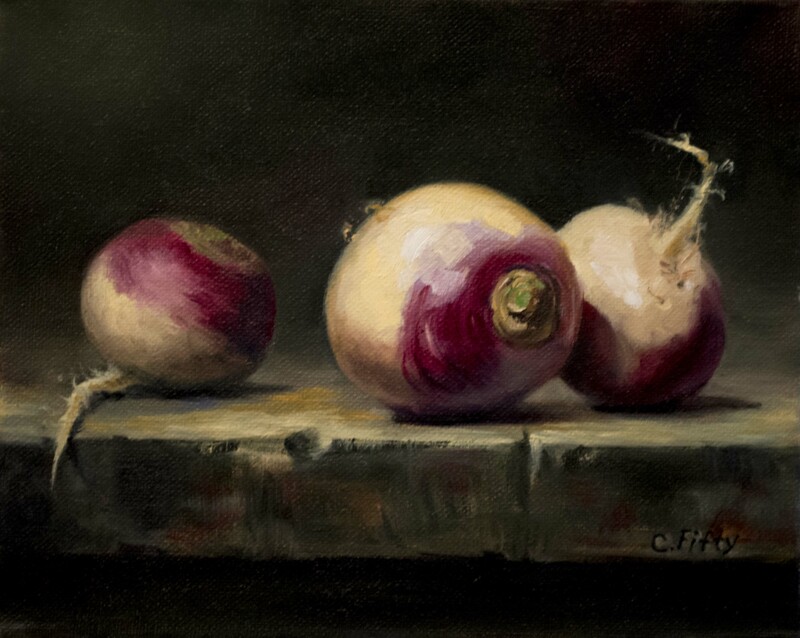 It won Best of Show and First Place at the Harford County Fair in August 2014. 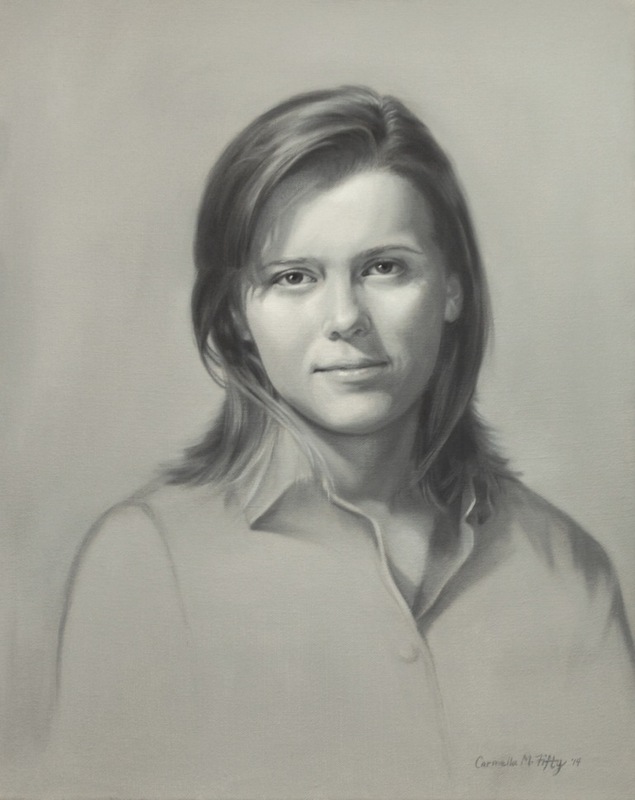 This is a grisaille of a young woman, Sam. 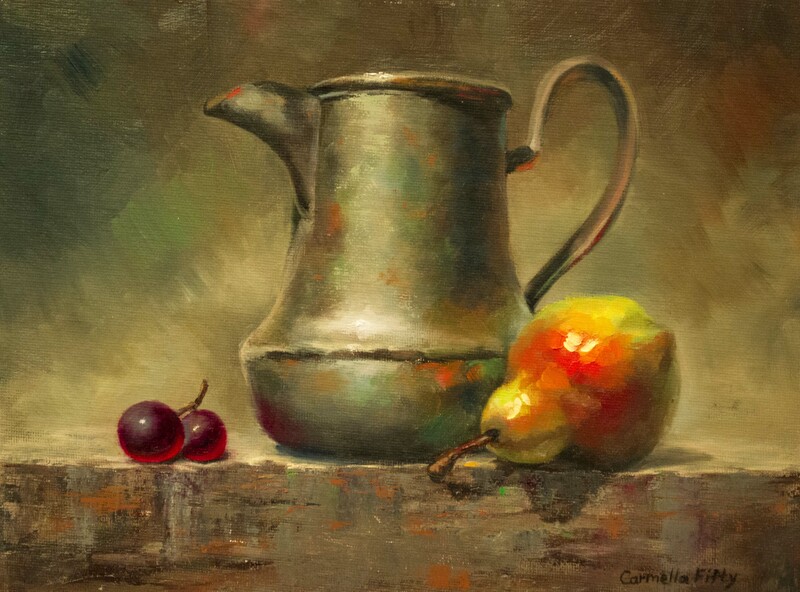 A grisaille (/gri zai/) is a painting technique made popular during the Renaissance which consists of using shades of gray to create dramatic lighting and a pronounced sense of three dimensionality. It is 16x20 inches. With bright red hair and the red background, the model, Ellen, practically glowed. I'll often focus on just the model's head and ignore their garb when I only have one or two sittings to complete my color sketch. 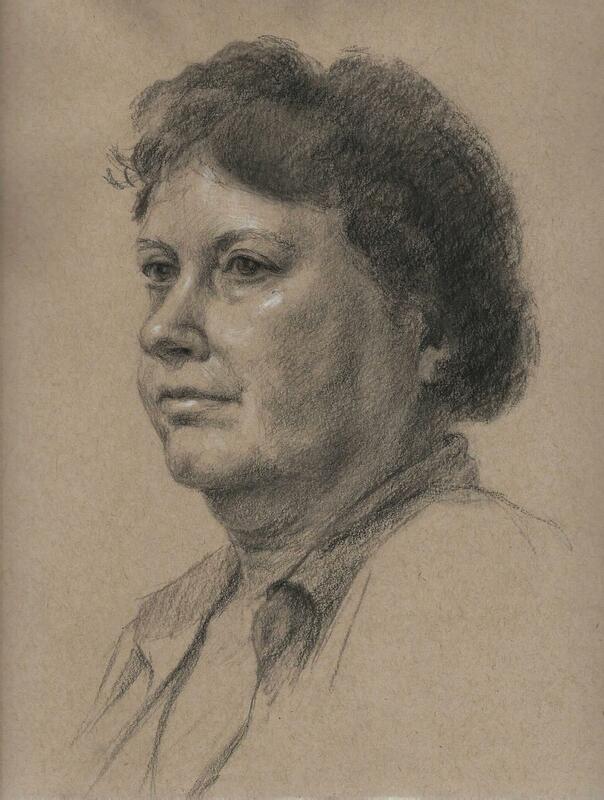 In a sketch, it is more important to capture who the model is, their character, than to have a polished painting. 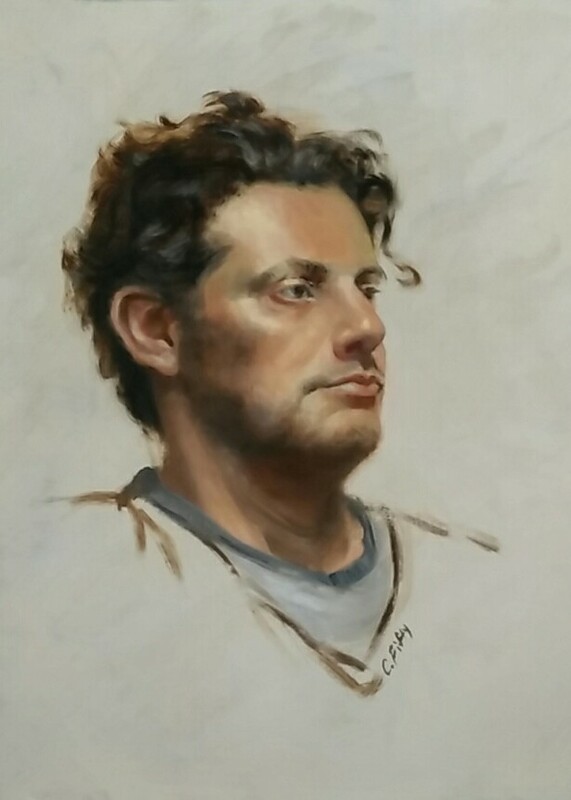 This oil portrait is 12" by 16". Painted in December, 2016. 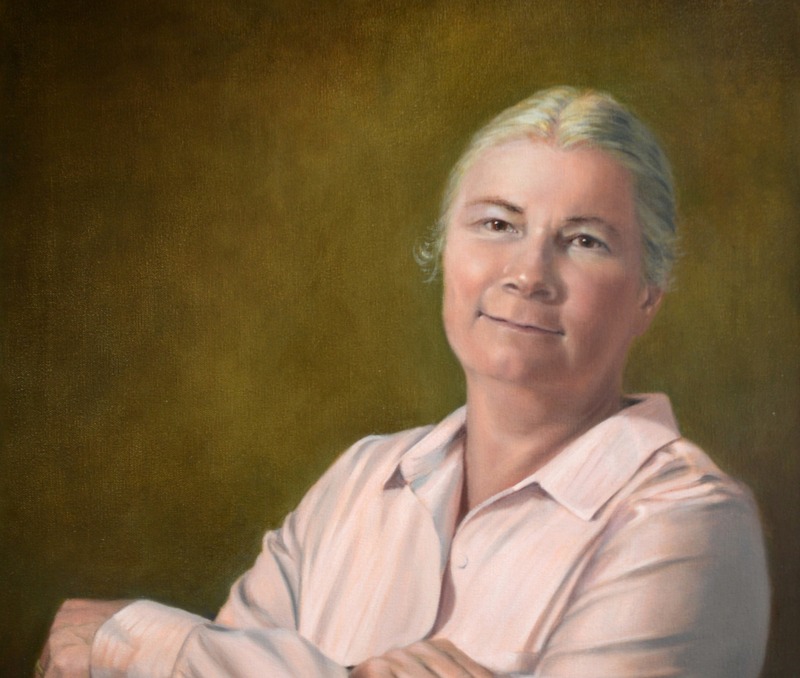 As a portrait artist, I find that immortalizing someone in a painting is intellectually challenging and artistically fun. My subjects find it to be a relaxing break from their daily routines. We both enjoy ourselves as we create both a painting and a friendship. I love it. 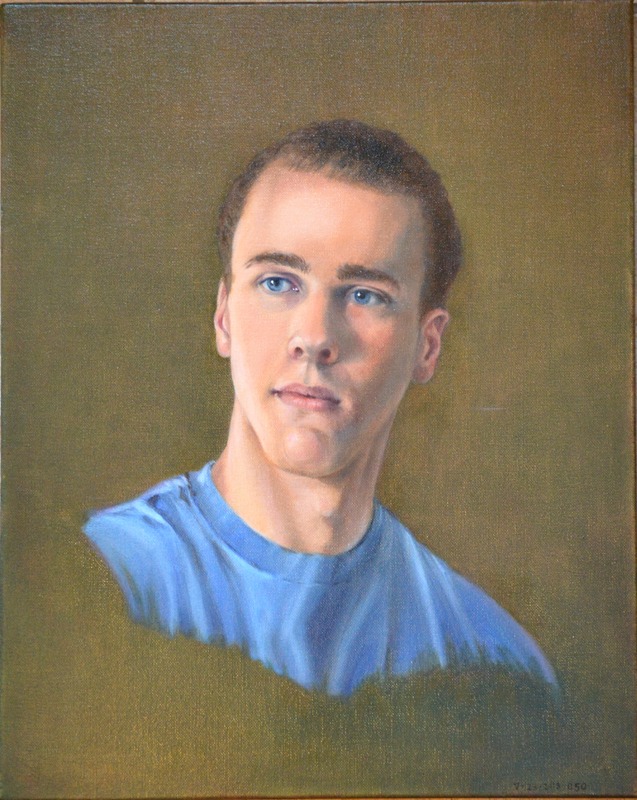 All the portraits in this gallery I have painted in oils on canvas or board. Even the two that are monochromatic, George and Sam, are oil paintings. They are grisailles. 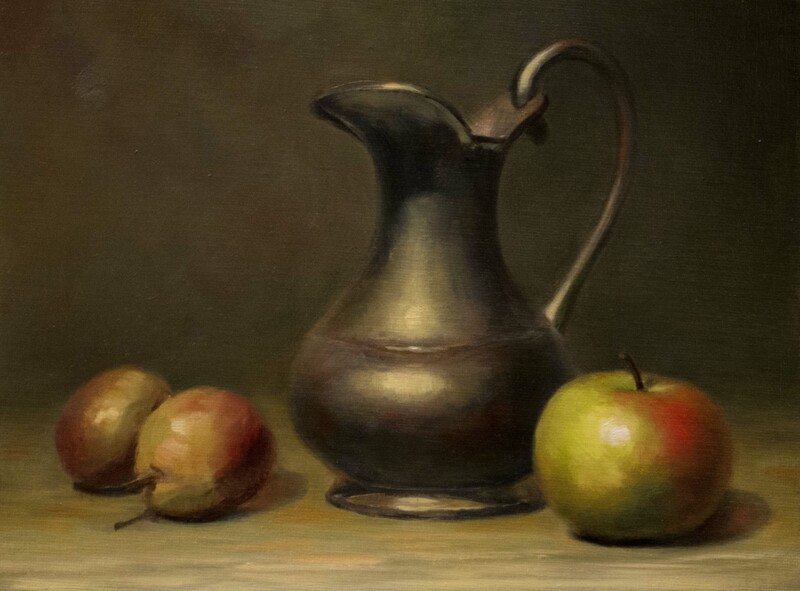 A grisaille (/gri zai/) is a painting technique made popular during the Renaissance which consists of using shades of gray to create dramatic lighting and a pronounced sense of three dimensionality. I am partial to classical realism. 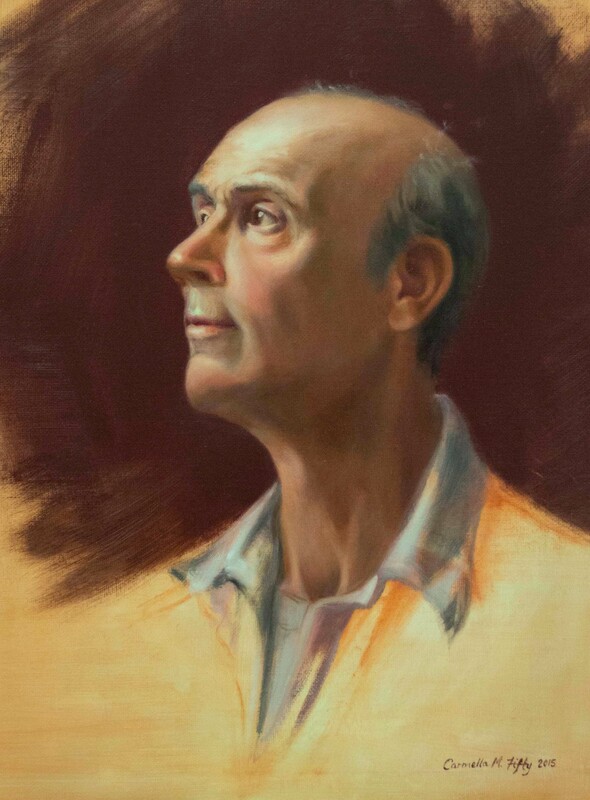 My goal is to capture a pleasing likeness that conveys the sitter's character and personality and answers who they are. 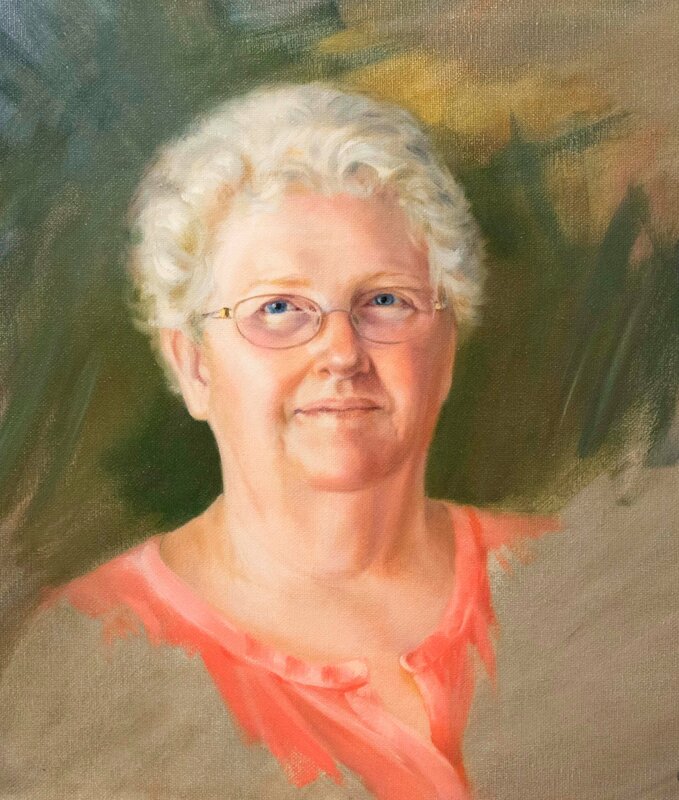 Portrait in oil on canvas of my neighbor Fran. 20x24 inches. 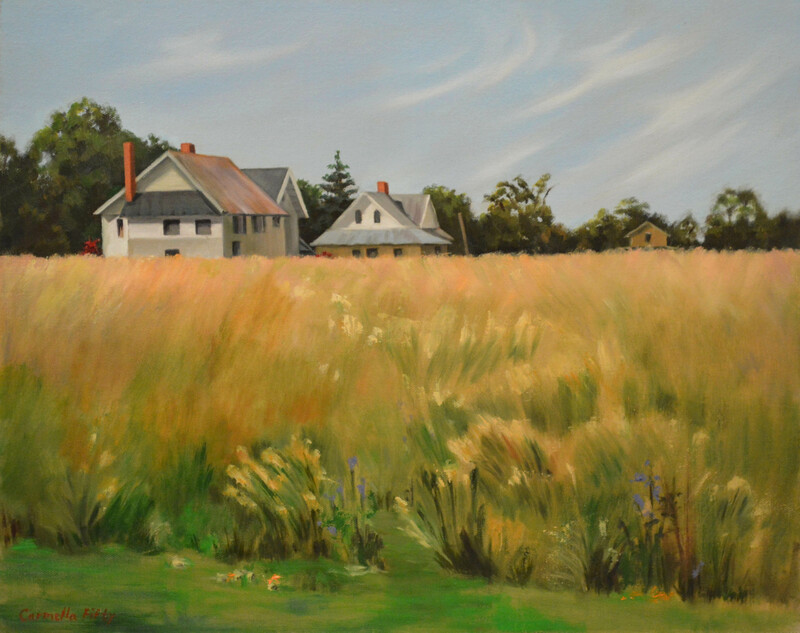 It won Best of Show and First Place at the Harford County Fair in August 2014. "Ann" won "Best of Show" and "First Place" at the Harford County Fair in August 2015. 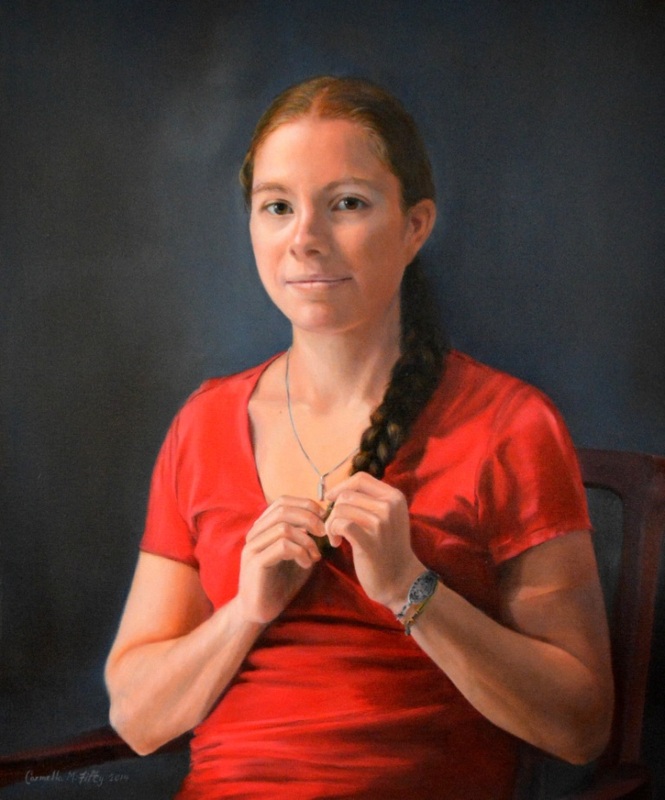 The painting also won the "People's Choice Award" at the Harford Artist's Annual Juried Exhibition. Oil on canvas. 20x24 inches. Oil portrait study of the model, Bob, on canvas. 12x16nches. 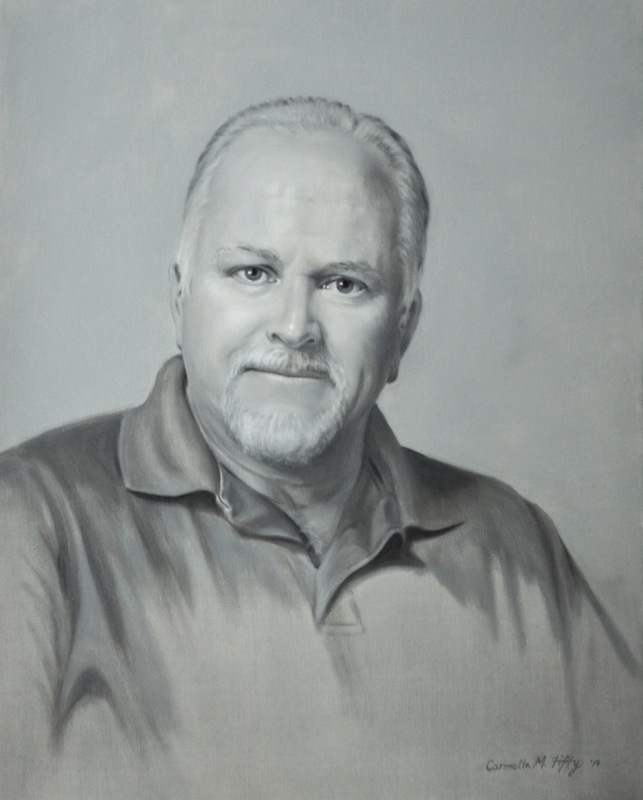 This is a grisaille, a black and white tone oil portrait of George, on canvas. 16 x 20 inches. Mary and I had so much fun during our sittings last summer. 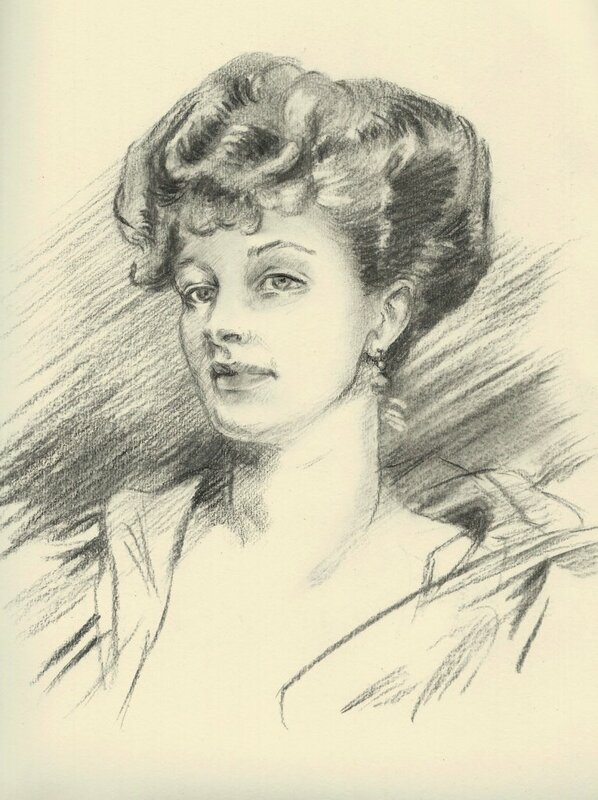 I think it shows in this portrait. Oil on canvas. 16x20 inches. 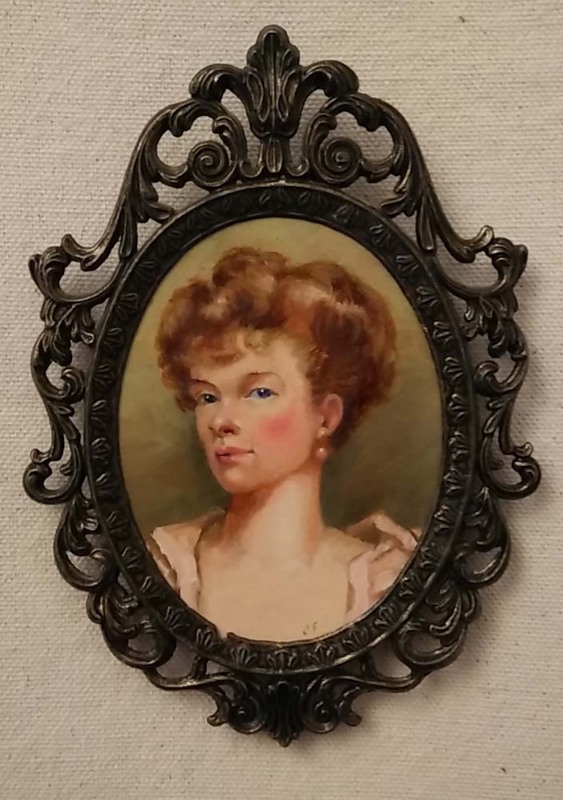 "Pretty Woman" is a miniature portrait that measures 2.5 x 3.25 inches. Pen and ink drawings by Gibson and Sargent drawings inspired me to paint this. Being able to draw from life is the hallmark of great artists. Since I always strive to become the best I can be, I regularly sketch from live models. 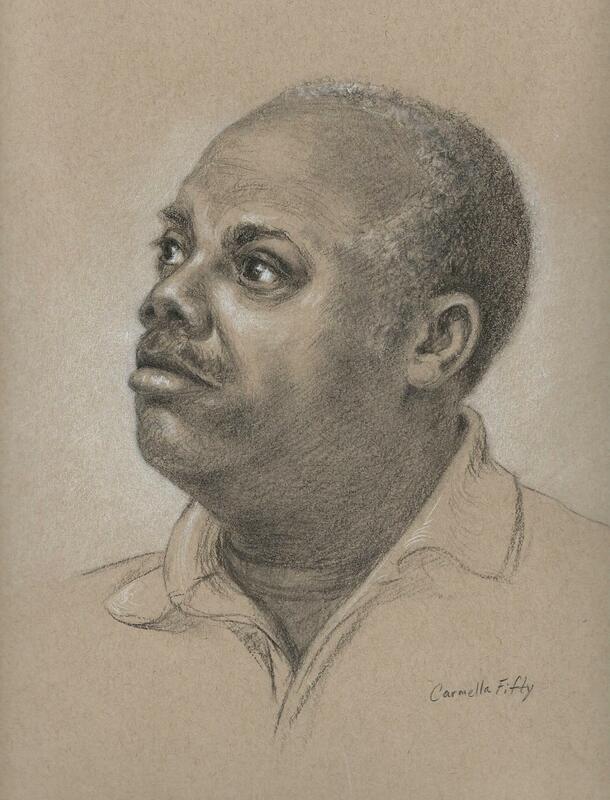 Several of these portraits I drew during my summer Tuesday morning open drawing sessions that I organize for local artists and conduct in my studio. Others I drew in classes or from private sittings. I drew most of these with charcoal pencils on Strathmore Toned Tan paper, Canson colored papers, or on white drawing paper. 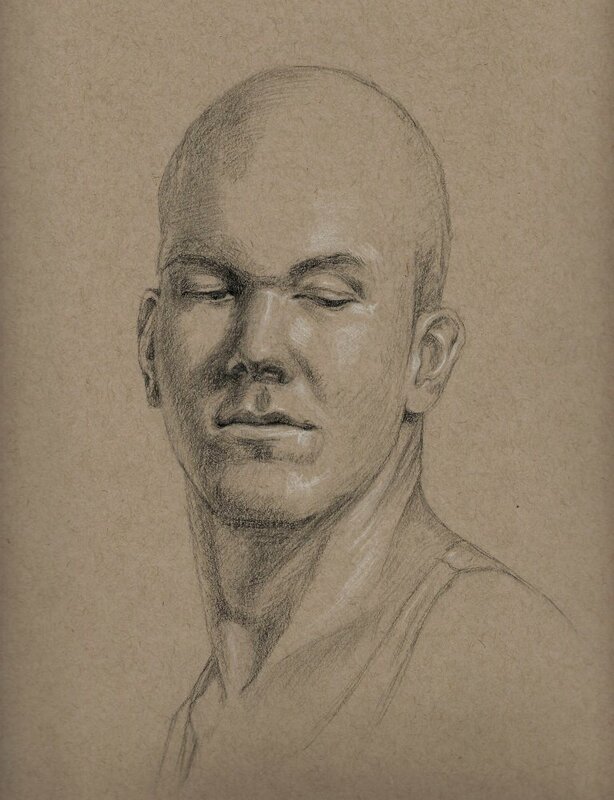 Charcoal on Strathmore colored paper of a physical trainer from my gym. 9 x 12 inches. Charcoal on Strathmore colored paper of a model, Amory. 9 x 12 inches. Barbara was one of our summer models and wasn't able to stay for the full session, so I had to work quickly. Charcoal on Strathmore colored paper. 9 x 12 inches. Pencil studies of my husband's hands. 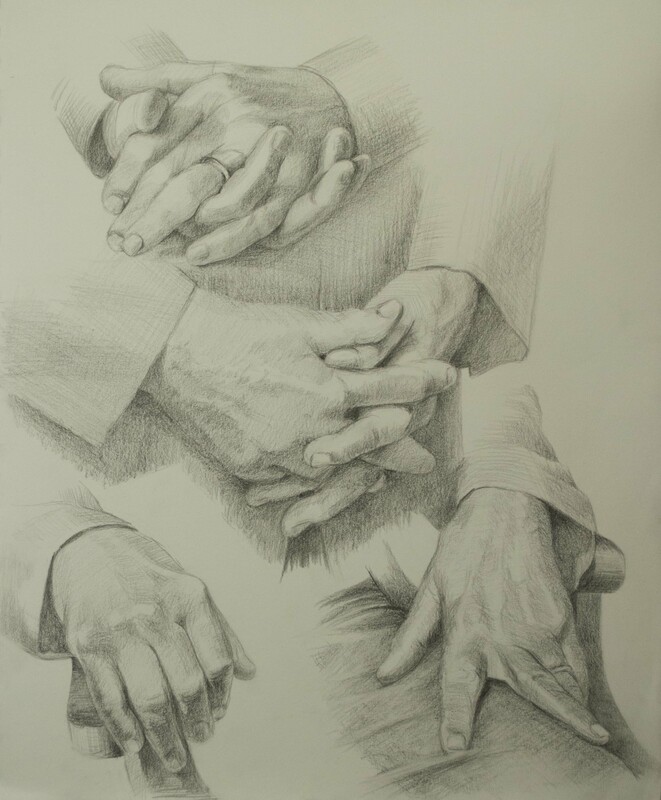 The ability to render hands is crucial in portrait drawings and paintings, so I routinely draw them. 11 x 14 inches. Conte on drawing paper. 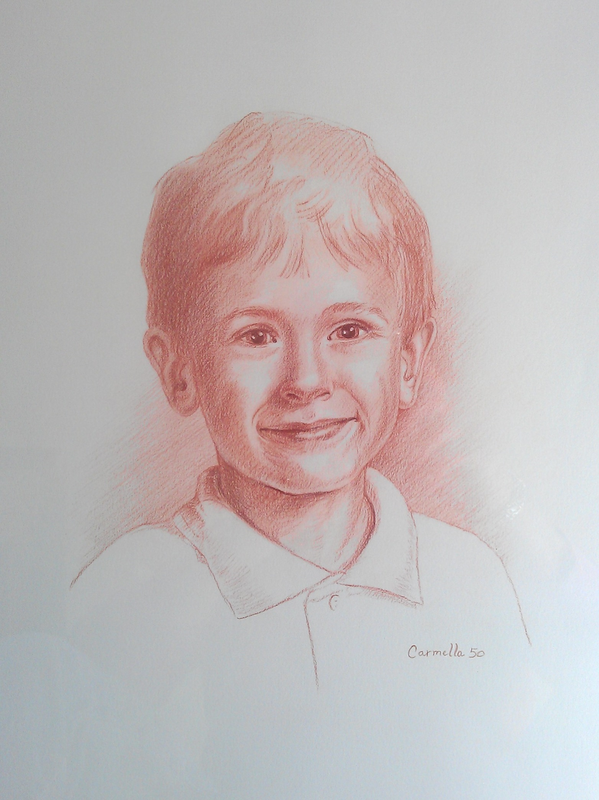 Going through some old school photos of my children, I wished that I had done some drawings of them when they were young, so I drew this from an old photo. 14x17 inches. Conte on drawing paper. 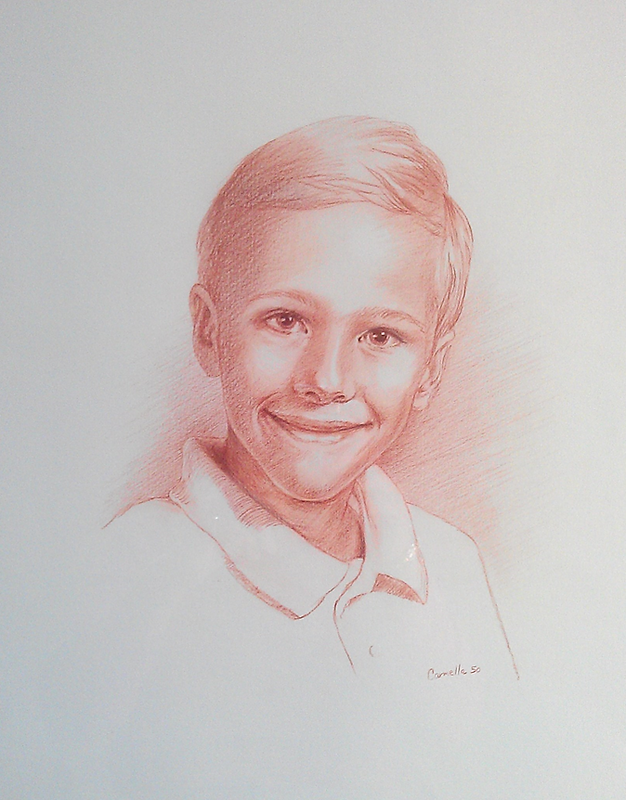 Here's my youngest son, Christopher, drawn from a photo. 14x17 inches. This is a charcoal sketch of Robin on toned tan paper. 9 x 12 inches. 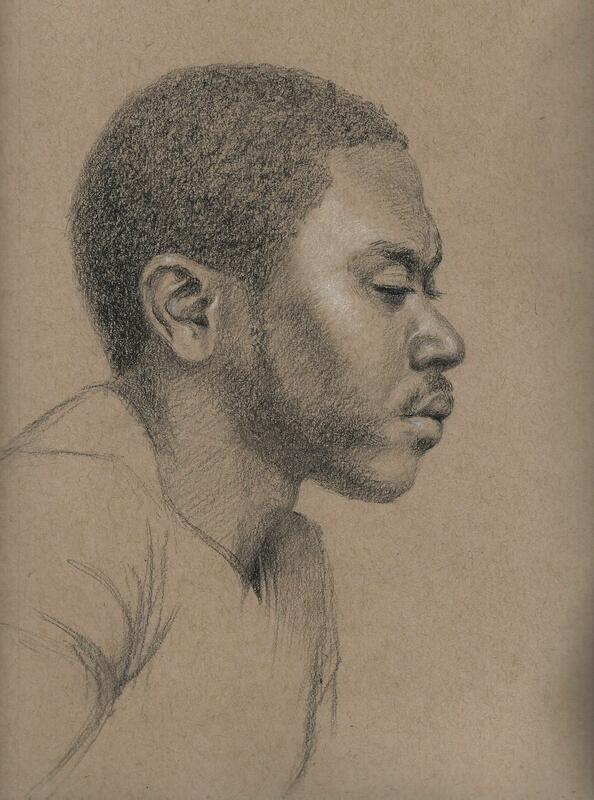 Marcus was a wonderful model to draw. This is charcoal on toned tan paper. 9 x 12 inches. 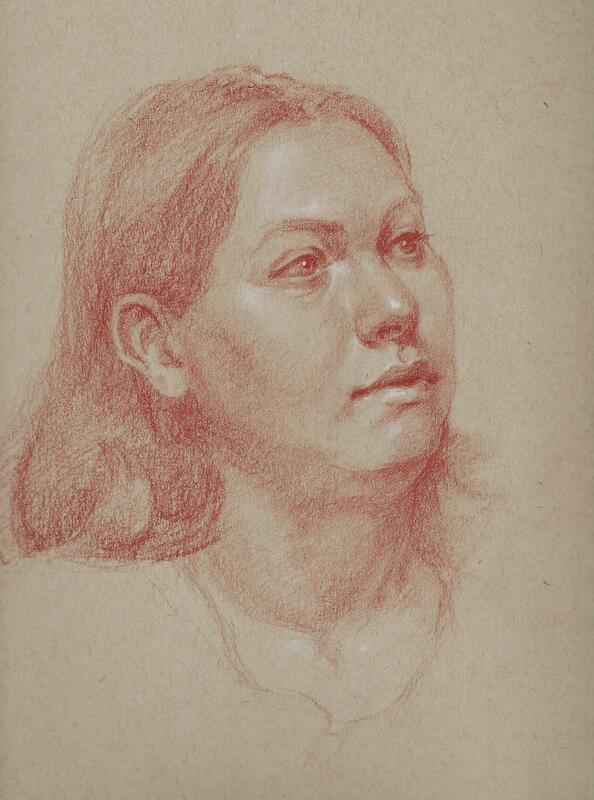 9 x 12 inch conte drawing of a model, Margaret. An exhibitor at a conference gave me a small sheet of coquille board and a grease marker with the suggestion that I have fun doodling on it. The black grease pencil when moved over the pebbled surface left a dot like pattern that can be reproduced like a pen and ink drawing. I sat down and doodled this man. I was sold. I later used this board for illustration projects. 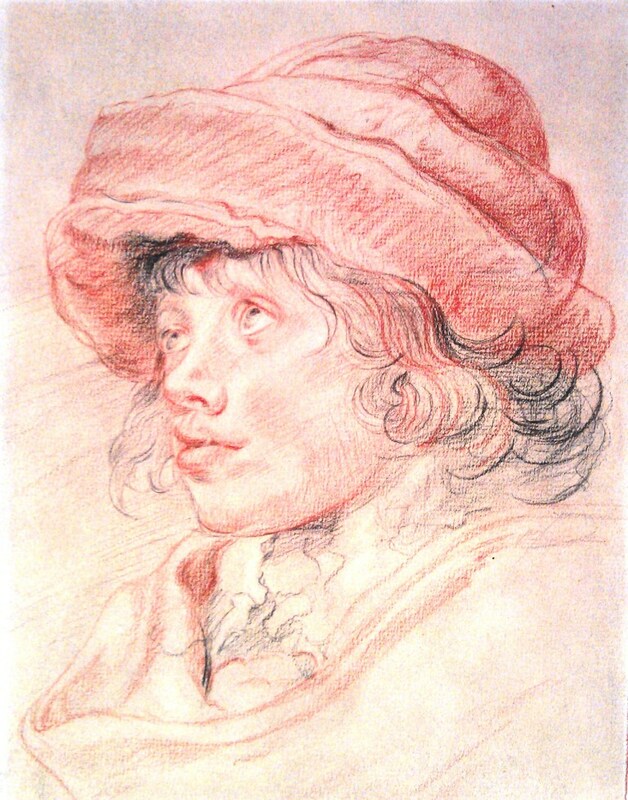 Why copy an old master drawing? Copying from a master is no mere duplication of someone else’s work. It is an intimate engagement with the thought processes of the master’s mind. By copying a drawing or painting, I learn how to see the way they did; I discover their thinking process. Experiencing how they shaded or painted specific areas offers me an arsenal of symbols and techniques. I learn how to mix color or how to make marks to convey the intended truth. 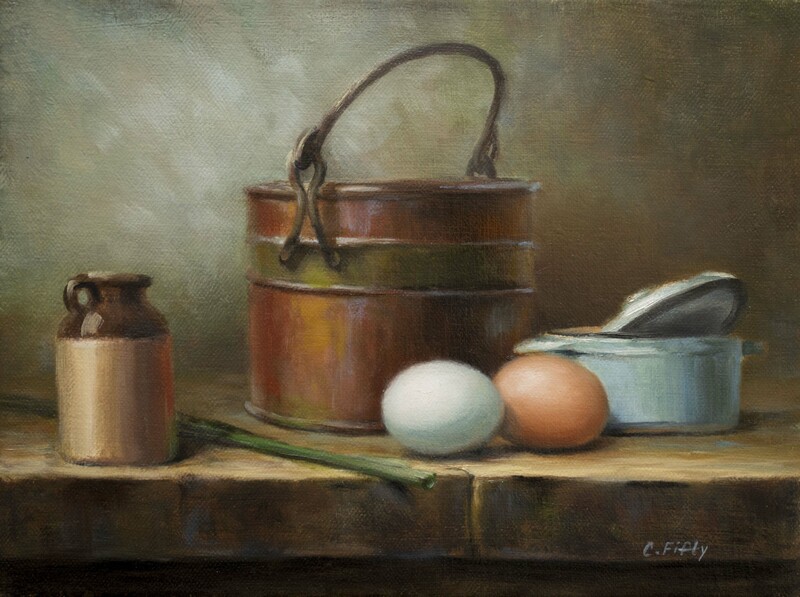 By studying their use of edges, line, light and value, composition, proportion, shape, color, and rhythm and asking why the master did things a certain way, I can use the same strategies and techniques in my own work. Through this immersive experience, the master guides me through the creative process imparting important art principles which quickly become second nature. Why do people purchase old master copies? 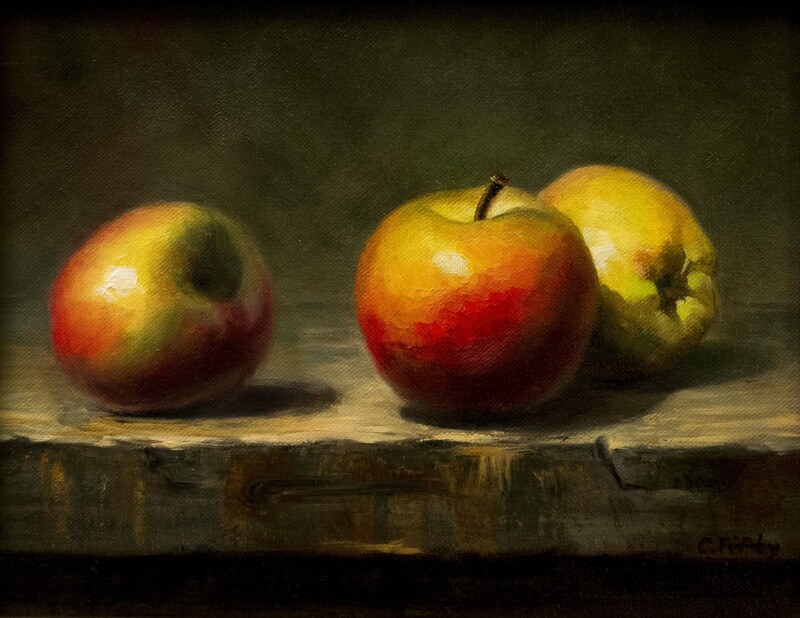 They are beautiful great works of art with the richness of mark, texture, and color that photo reproductions lack. 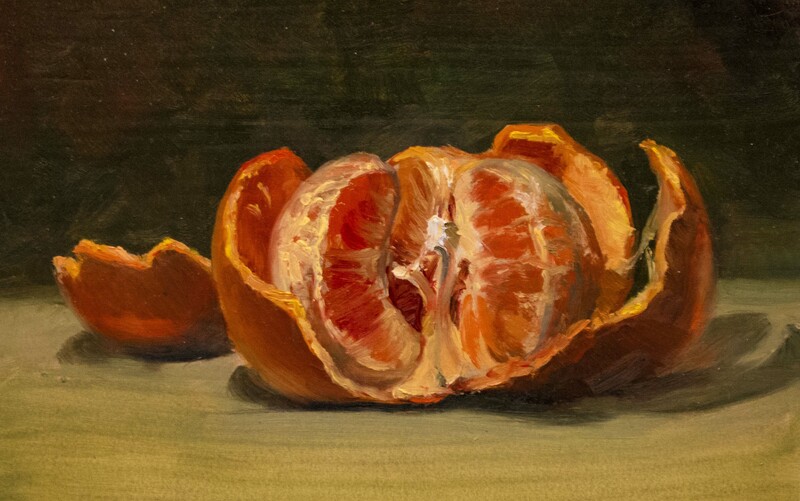 The elements of color, composition, light, form, and rhythm, which made the original work magnificent, are all present, and still creating a beautiful piece. Most da Vinci, Michelangelo, Rubens, Rafael, and other old master works hang in museums, unavailable for purchase. 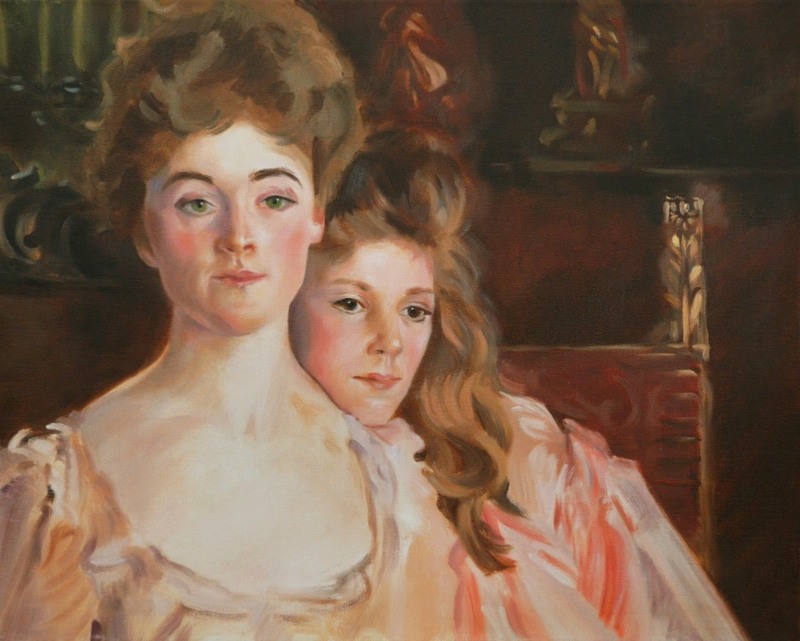 Artist rendered fine art reproductions are affordable alternatives which enable people to enjoy great works of art in the comfort of their own homes. Conte on charcoal paper Michelangelo copy 9x12 inches. 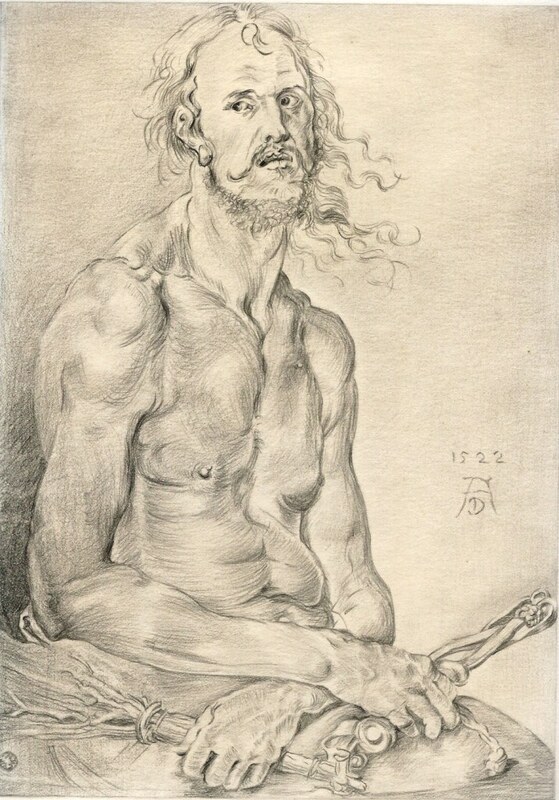 Pencil on drawing paper of Man of Sorrows, after Durer 9x14 inches. 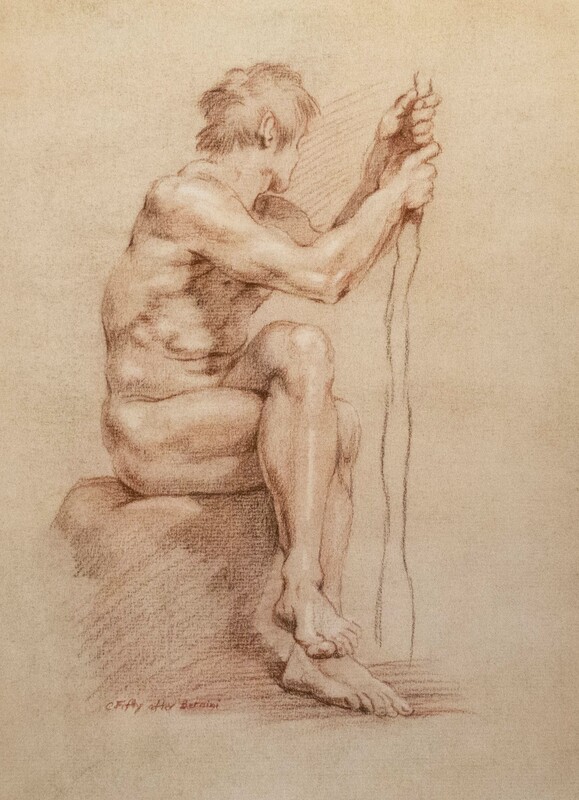 Tri-color conte on charcoal paper Peter Paul Rubens copy. 11x14 inches. 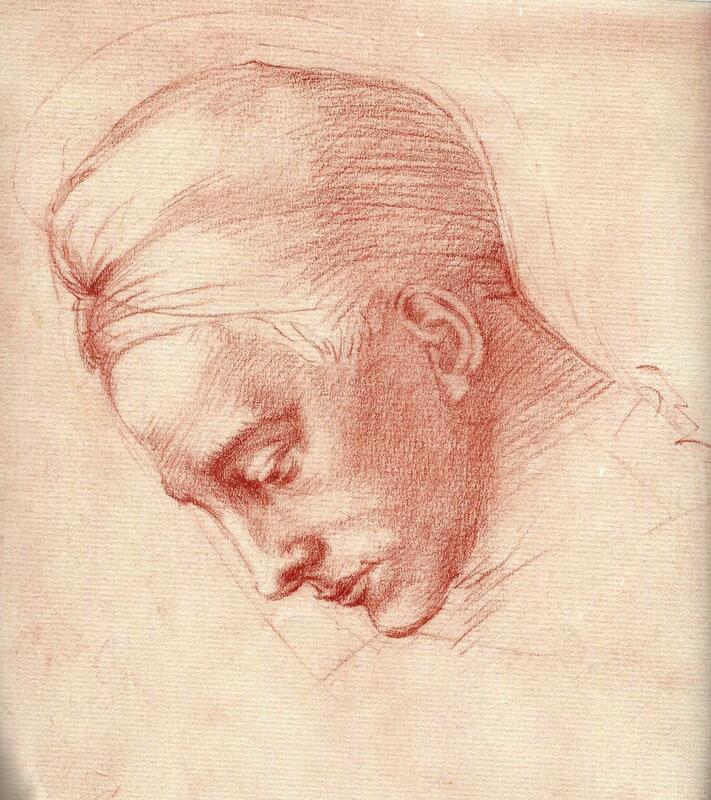 Pencil on drawing paper Camillo Procaccini copy 9x14 inches. 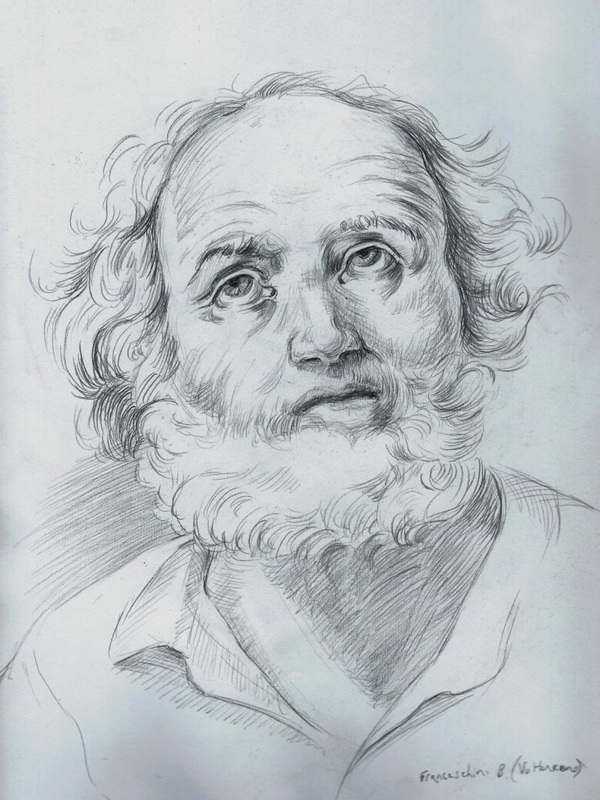 Charcoal draweing of a Franceschini B. (Volterrano) copy. 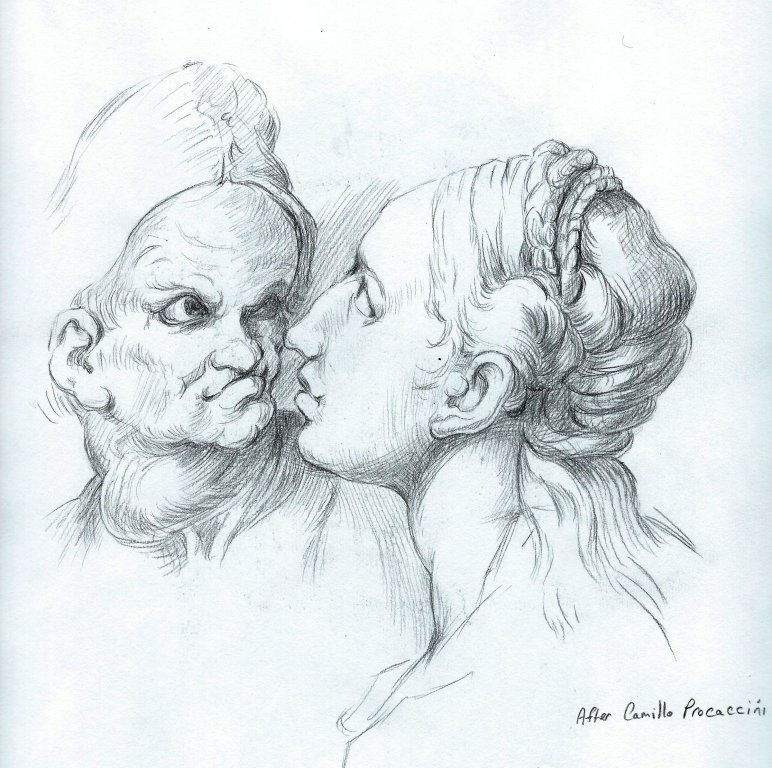 This is a copy of a drawing by the old master, Gian Loenzo Bernini. It is 11" by 14" on white charcoal paper that I toned with powered pigments and airbrushed watercolor paint. I wanted to match the background of the original drawing. I drew with conte pencils. Charcoal on drawing paper. 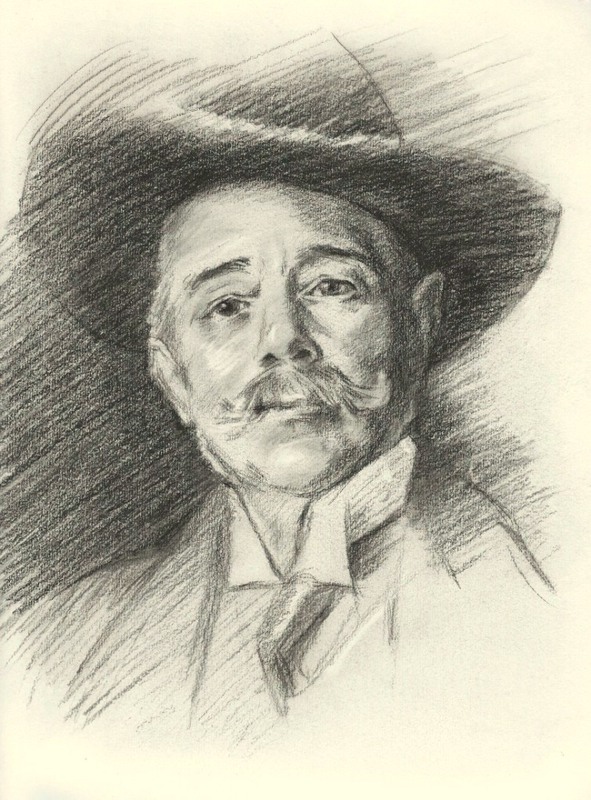 John Singer Sargent copy - "Ramacho Ortigao" 9x14 inches. 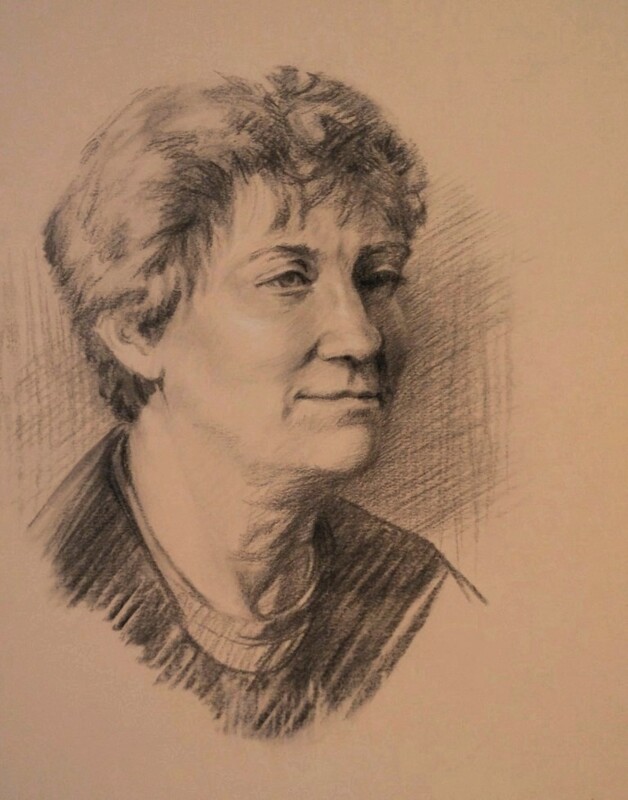 Charcoal on drawing paper of John Singer Sargent copy - "Woman" 9x14 inches. In June, 2015 I started painting outside on a regular basis. 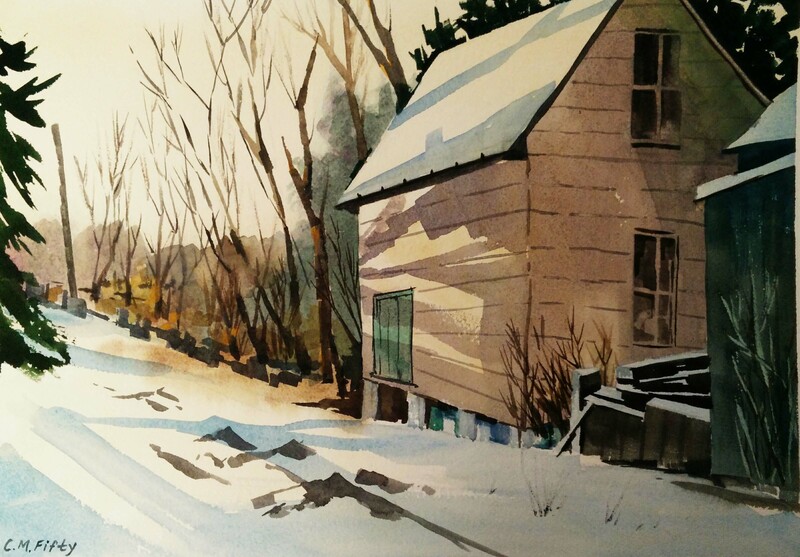 I love the immediate nature of the plein air experience. 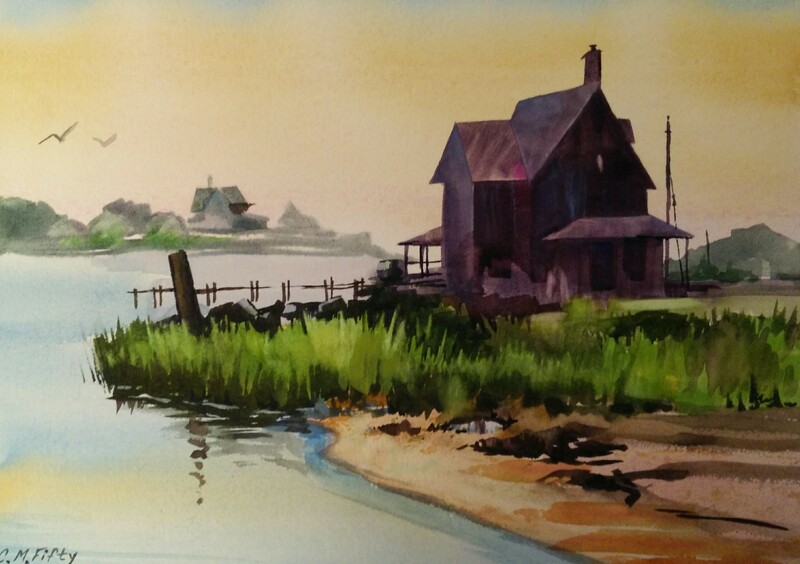 In October, 2015 I started painting landscapes using watercolors. All of these watercolors I painted in 2016. Painting outdoors introduces many new variables to the painting process. The sun progressing across the sky shifts the shadows cast by trees and buildings. Clouds transform further affecting the lighting and composition. The wind causes the grasses and leaves to sway or dance. The wind has even toppled my easel. The tide rises and falls. Everything is in a constant state of flux. Painting becomes immediate in nature. I must paint faster and looser in order to get as much down as possible before my view changes too dramatically. If necessary, I’ll return the following day to finish off the painting. I find outdoor painting exhilarating. Oil on canvas. 16x20 inches. I set up my easel in the Level Firehouse parking lot looking toward the houses across Rt. 161 on a beautiful June morning. I returned the next morning to finish it up. The day before, I was looking at Edward Hopper's work on the internet. 16x20 oil on canvas. 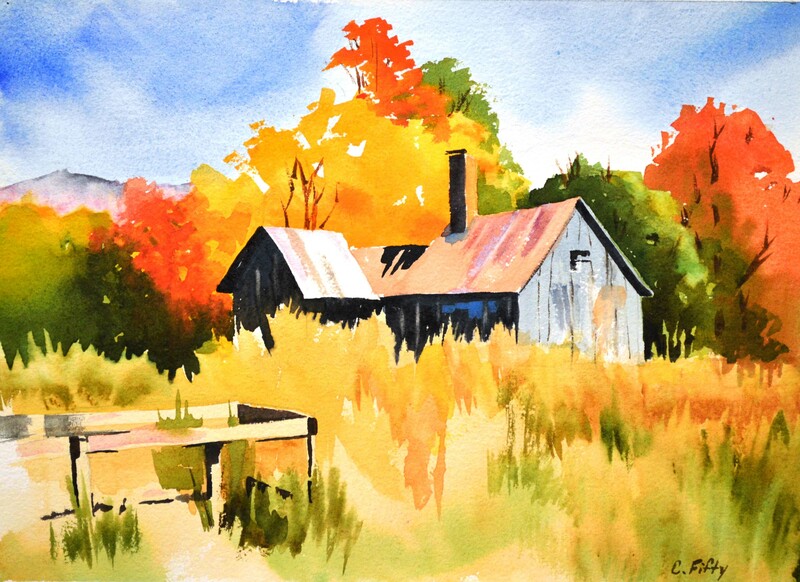 This farm was ideal for plein air painting. I had a shady spot to set up my easel and parked my van, back hatch open, right next to me. The lady of the house commissioned me to paint her family home as a Christmas gift to her husband. I set up my easel in their yard last September during a weekend when they were out of town. Now that it is after Christmas, and no longer a secret, I could add it to my page. Oil on canvas. 12x24 inches. 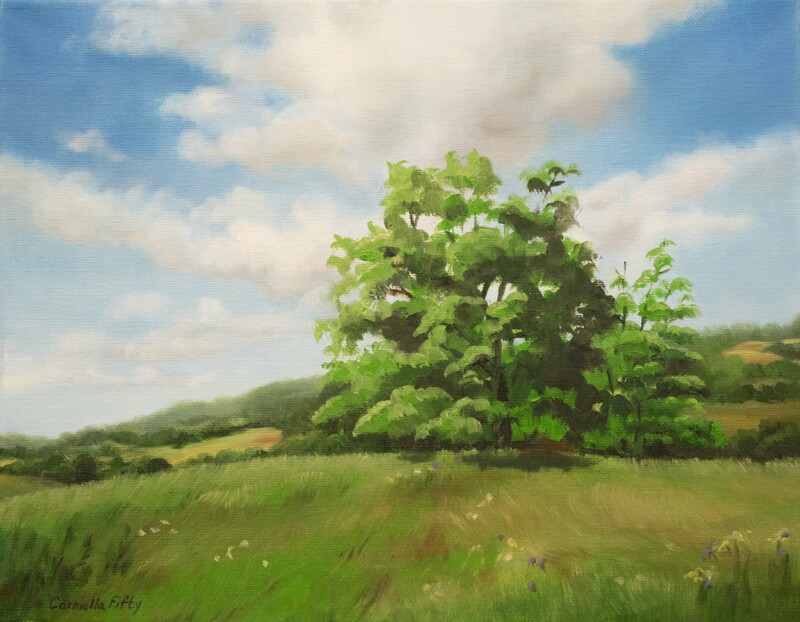 Although a plein air painting, I captured the sky in Churchville, the hills and pastures in Level, and the trees in Darlington. 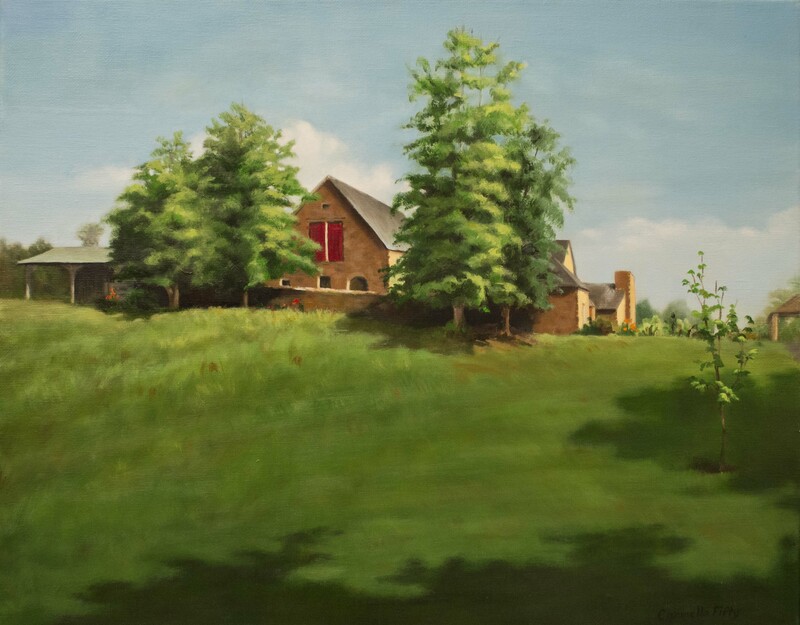 I enjoyed combining the three locations to create this classic Harford County scene. 11x14 inches. Oil on canvas. Watercolor, 9 1/2 x 13 inches. I took my first real art class in the summer of 1978. 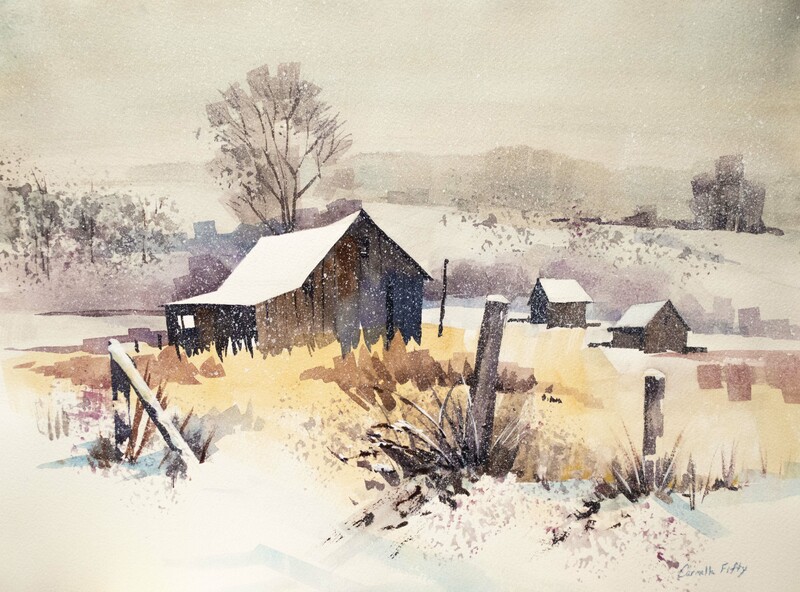 It was painting landscapes in watercolor on location with Fritz Briggs every morning for five weeks. Immediately afterwards, life interveined and I packed my paints away. 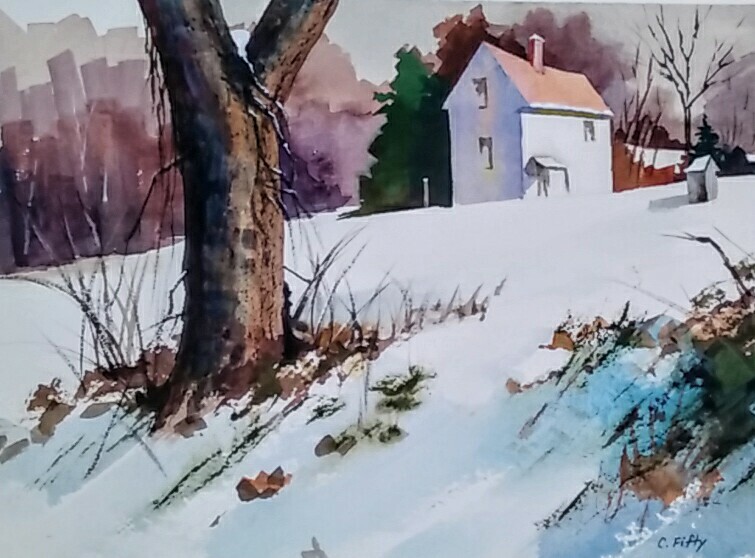 This past October of 2015, I dug out my old supplies and decided to give watercolor another try. After 37 years, my supplies still worked fine. Here I have painted autumn in Frostburg, MD. 9.5" by 13". Although I love to paint outdoors, I prefer to take a photo, if there is snow on the ground than sit there and freeze. This 11" by 15" watercolor I painted in the warmth of the studio. Painting outside has made me realize how variable the color of the sky can be; it is often shades of yellow. I fell in love with this old shack the minute I saw it. 11" by 15" on Arches paper. I fell in love with the twilight raking shadows across the barn off this snowy road of my friend's photo. Here is a miniature, 2.75 inches by 3.75 inches. After painting most of my recent landscapes in watercolor, I am now applying that more impressionistic style to my oil work. Flurries floated softly on this fresh blanket of snow in western Maryland. 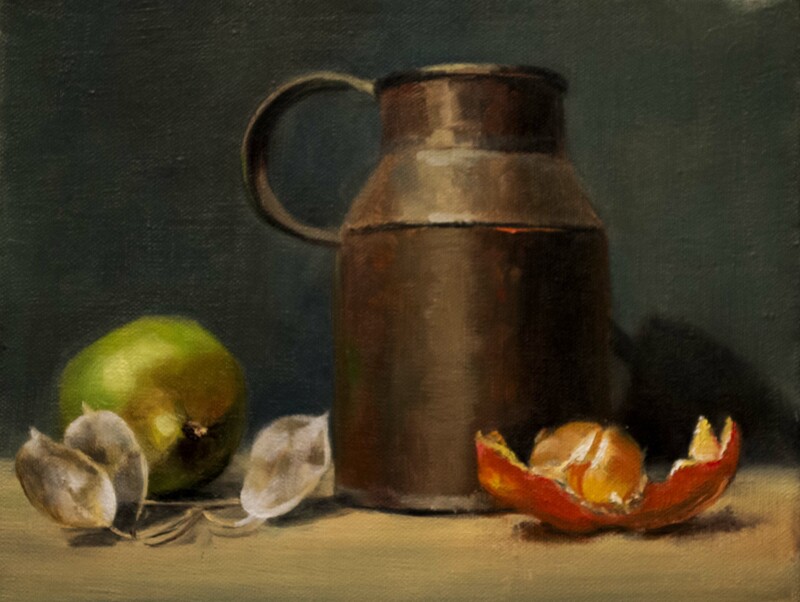 Still life painting uses commonplace objects such as food, flowers, vases, plants, and shells. As an artist, I have the freedom to choose the composition, design, colors, and the mood all by the objects I pick and how I arrange them. I painted most of these on wood panels which I prepared using the classical technique with rabbit skin glue and calcium carbonate. Others I painted on canvas which I primed with rabbit skin glue and an oil based ground. A few, I used commercially available pre-primed canvases. 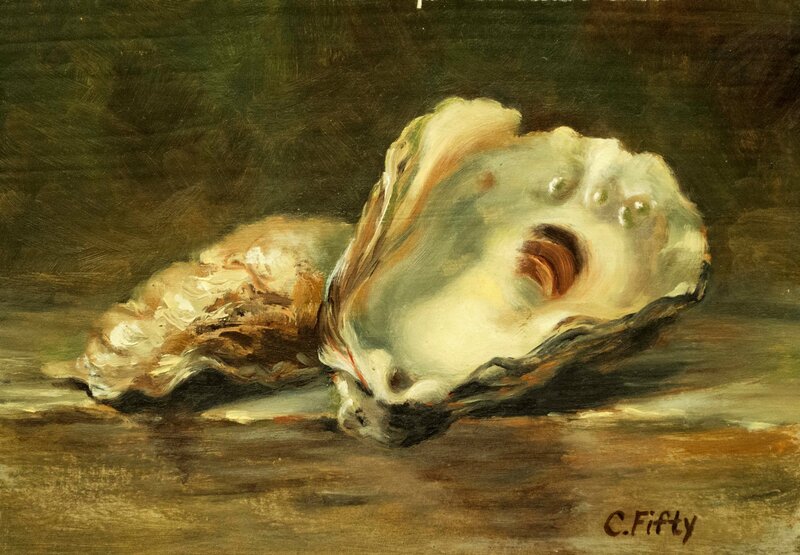 Since oyster shells are common elements in many classical still life paintings, I decided to give them a try. 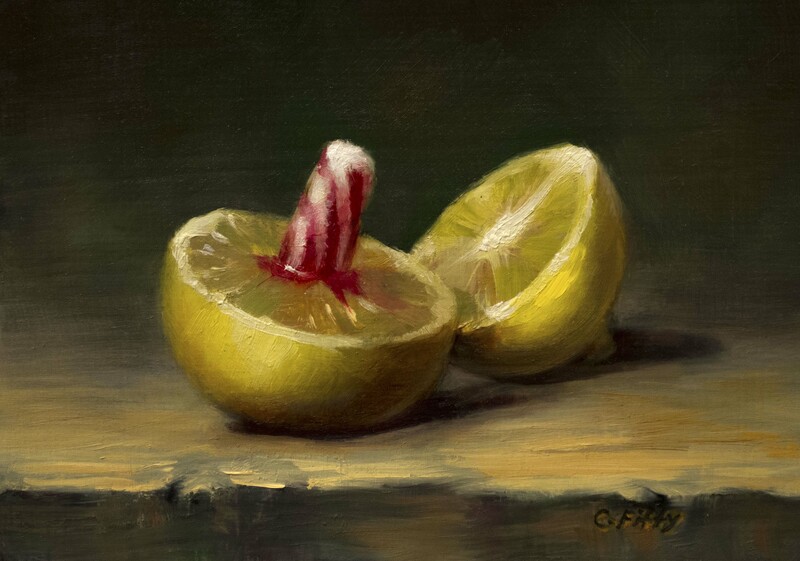 This was a quick study, 5x7 inches, oil on board. I was thrilled when it sold in the first hour after the gallery show opened. My cousin has chickens that lay beautiful colored eggs; some are blue and others are shades of brown. I painted this after a recent visit. 5x7 inches, oil on board. 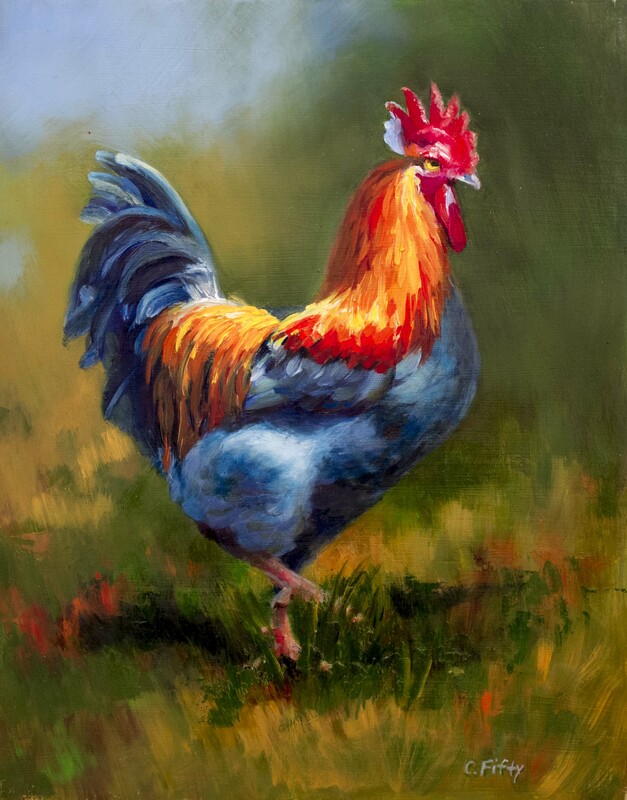 Last August I spent an hour sketching chickens and roosters on a farm in Harford County. They wouldn't hold still and were quite a challenge to draw. 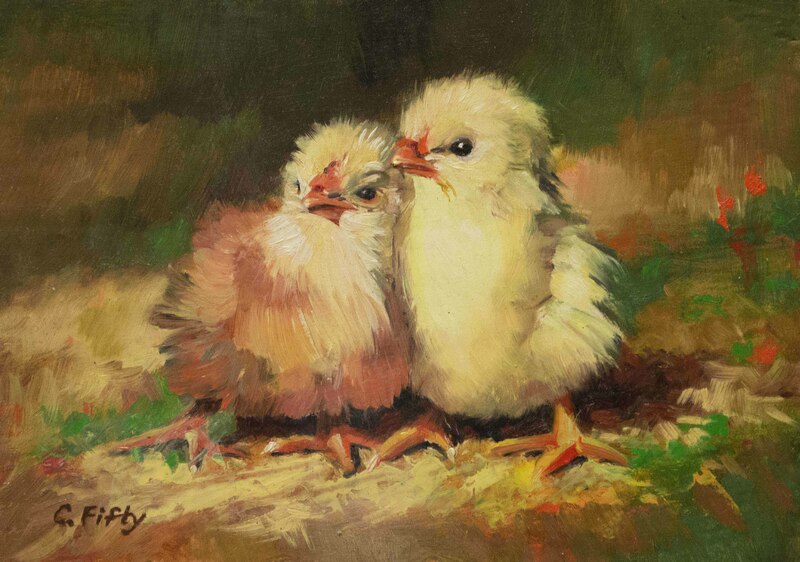 Inspired by my quick sketches and with the help of Google images, I painted these chicks. These are all pieces that I have a special attachment to that didn't fit in one of the other projects. They include pen and ink, drawing, pastel, oil painting, and sculpture. They are all very different and show the breath of my fine art explorations. Pen and ink on Bristol paper. 8x10 inches. 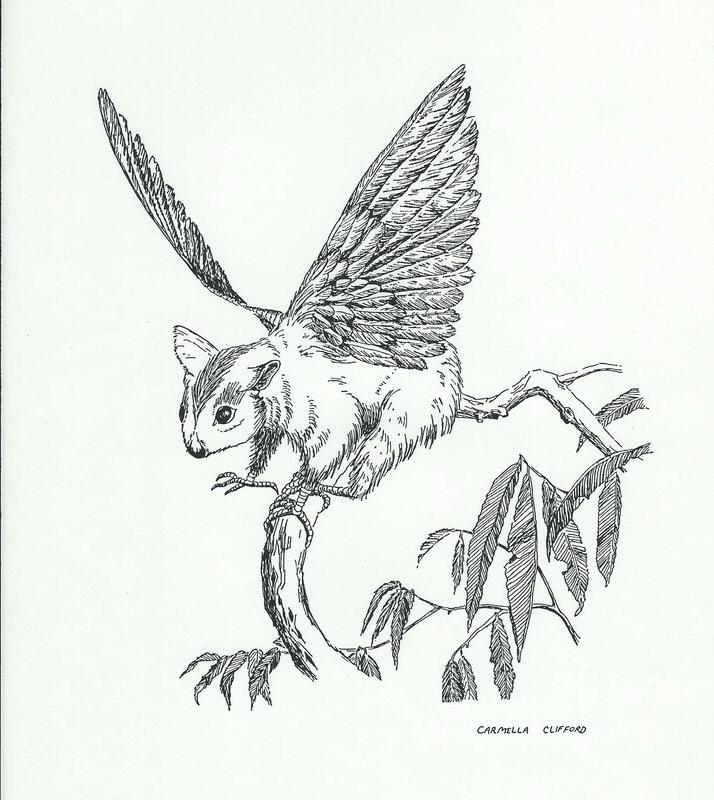 The squirrel outside my window seemed to fly onto this branch, inspiring me to give him wings. Since that was so anatomically contrived, I decided to give him scales too. 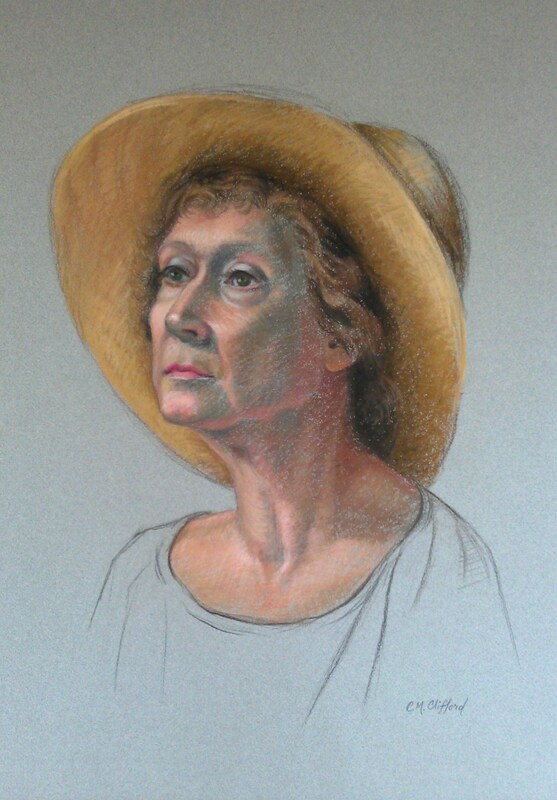 Pastel on mi teintes paper. Drawn from life in a class taught by Daniel Greene. The model liked the portrait so much that she offered me a couple hundred dollars for it. Since it was my first experience using pastels, I wanted to keep it for reference. It is the oldest piece in my portfolio. I did it the year before I got married and changed my name. 16x20 inches. 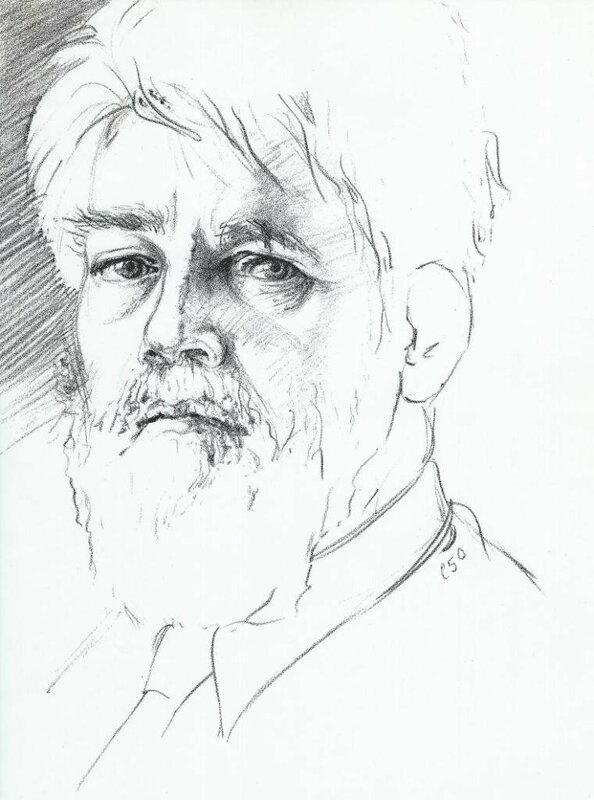 Pencil on sketch paper. 5 1/2x 6 1/2 inches. 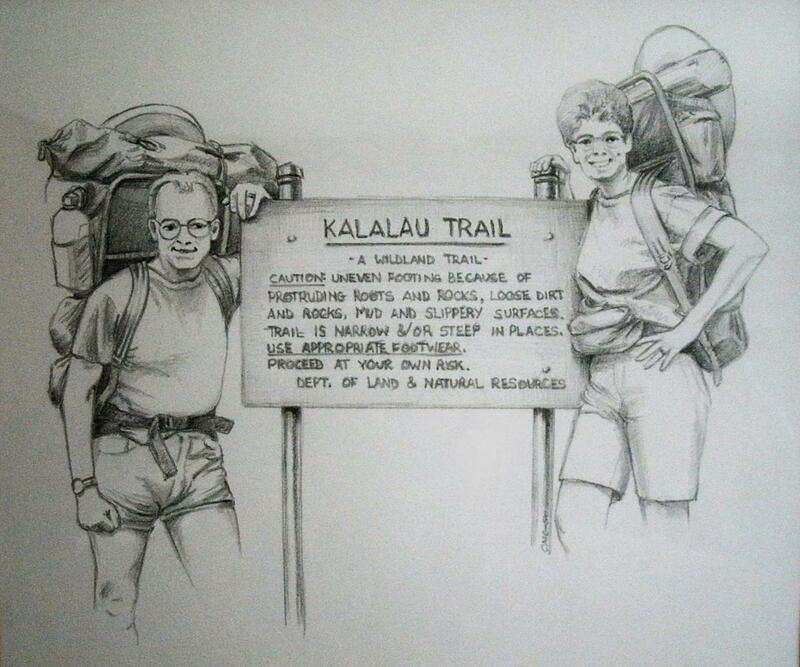 I don't usually work from photos, but when I came across this one from my honeymoon, I decided to make a collage of sketches to hang in my family room. The trail was eleven miles of the hardest terrain I have ever hiked. 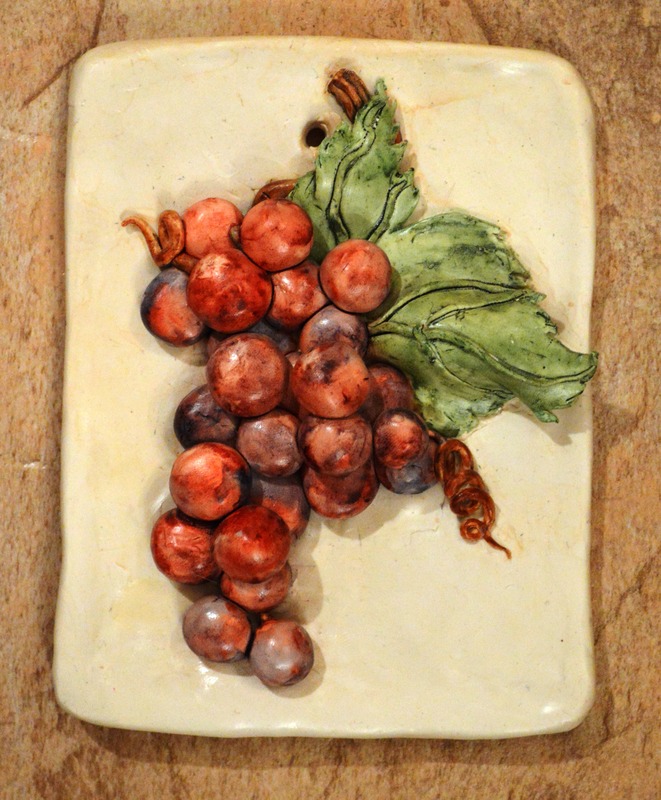 Relief created to match my newly renovated kitchen. Watercolor over baked white Sculpey clay. 4 1/2 x 5 1/2 x1 inches. When my children were quite young they played with Play-Doh. After that they graduated to Sculpey clay. One day they were having so much fun that I had to join in. They made star cruisers and I made grapes. 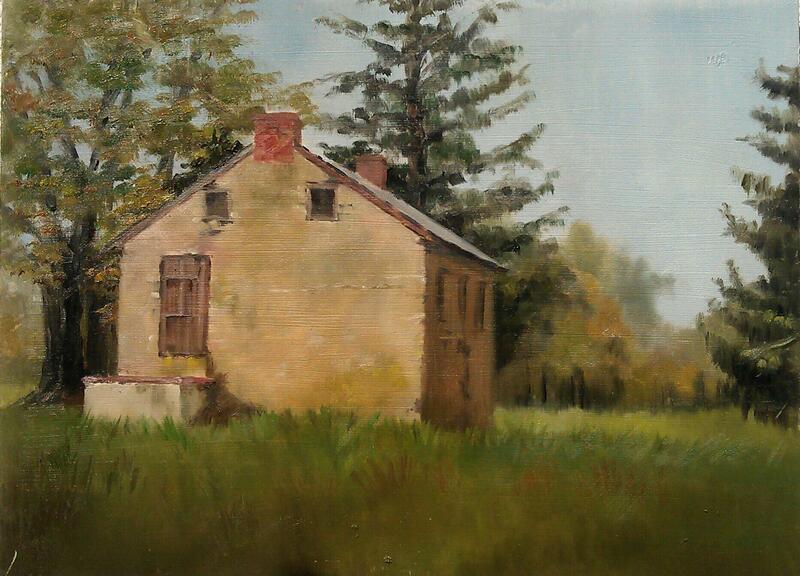 Oil on canvas of the old stone house at Old Fields, Bel Air, MD 9x12 inches. 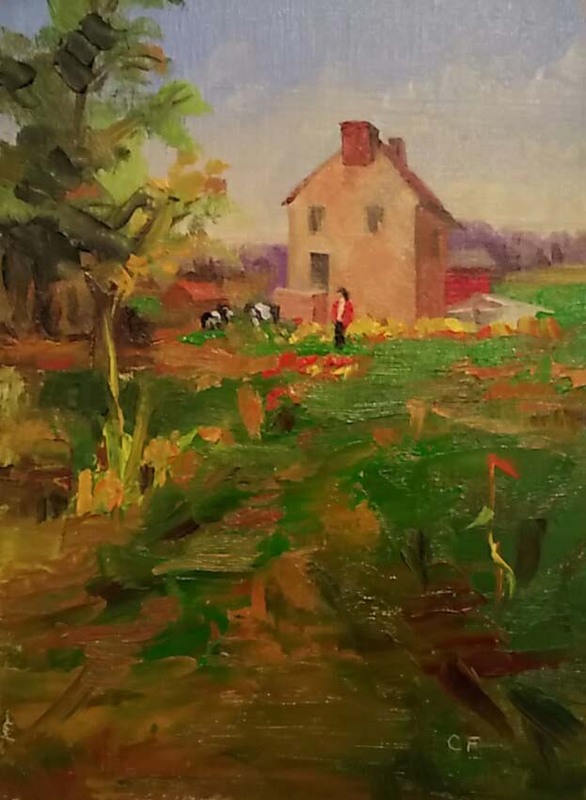 Although I had never painted landscapes or outside, I joined a group of plein air painters and painted with them all over Harford County. This is my first landscape. I was hooked. Fall 2014. 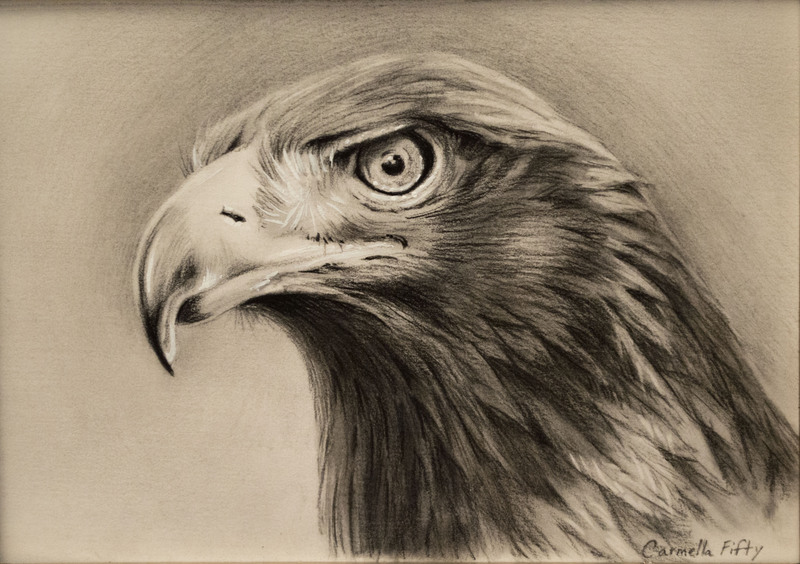 I drew this eagle in April of 2016 in carbon pencil on ledger paper. It is 5" x 7". I drew this in response to pre-election escapades. I love our country. This rooster had the most vivid colors of any rooster I've ever seen. After sitting in the chicken yard sketching away for a couple hours, I shot some cell phone pictures so that I'd be able to paint this one in the comfort of my studio. It is 9" x 12". September 2016. 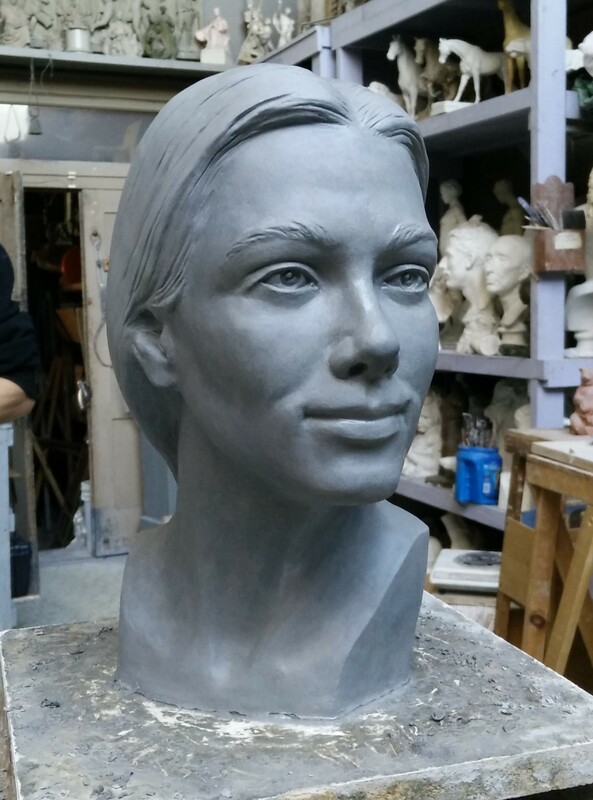 In a sculpture class at Schuler School of Fine Art, I sculpted this woman based on several pieces and my imagination. It is life sized and in clay. 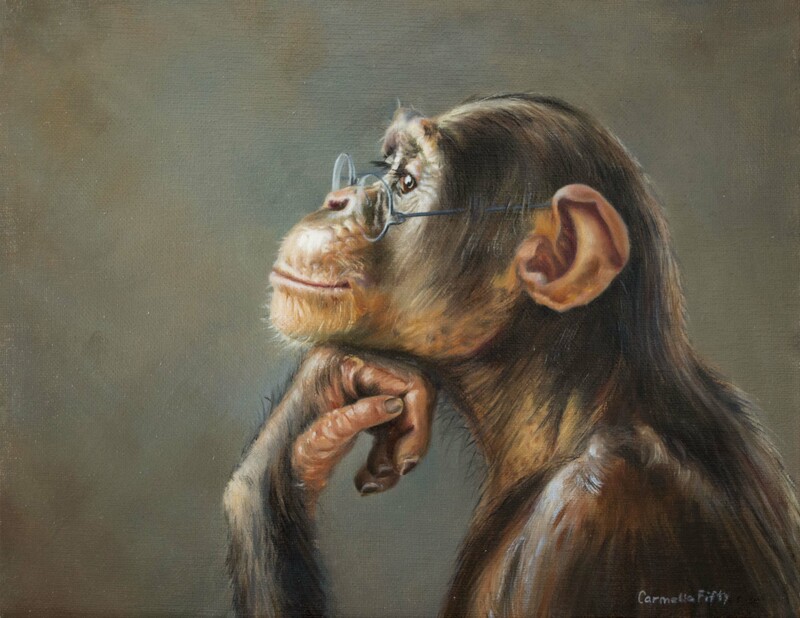 I painted this chimp to submit to the Schuler Annual Fur to Feathers Competition in Baltimore. It won first prize and sold during the reception. 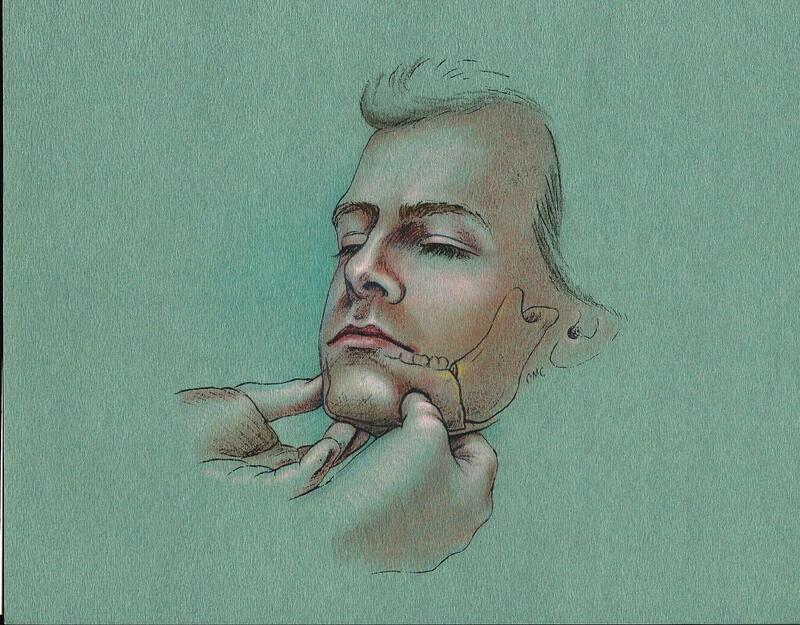 This glimpse into my background as a medical illustrator specializing in maxillofacial reconstruction shows how I learned portraiture from the inside out. I illustrated for texts, slides, journals, video, TV, exhibits, and brochures. I designed and produced 3-D models and exhibits. 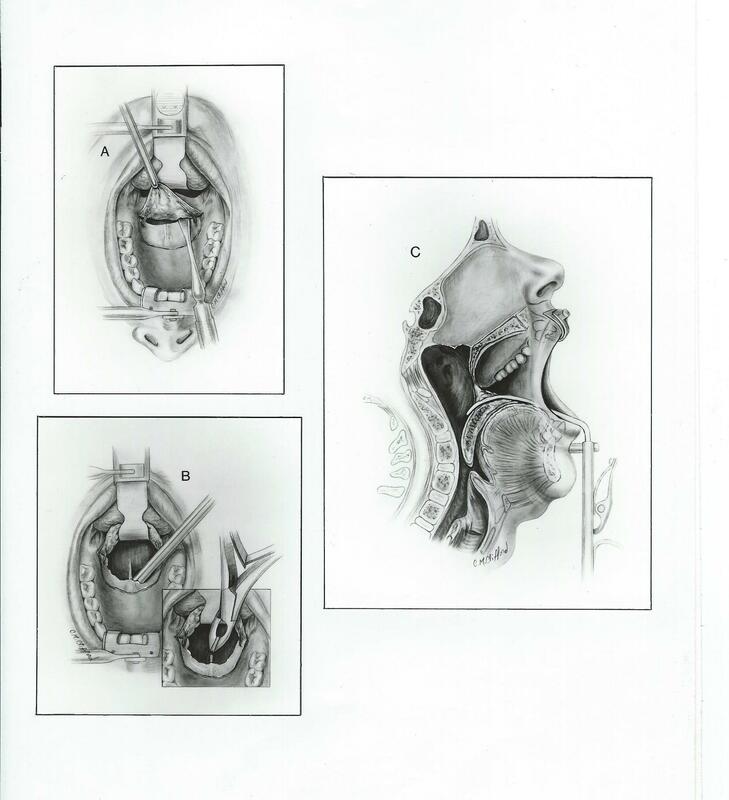 This involved client/artist consultations, estimation of time/cost factors, surgical sketching, anatomical dissection, experimentation, reference search, and the determination of the best approach to visually represent the solution in the most appropriate format and techniques. 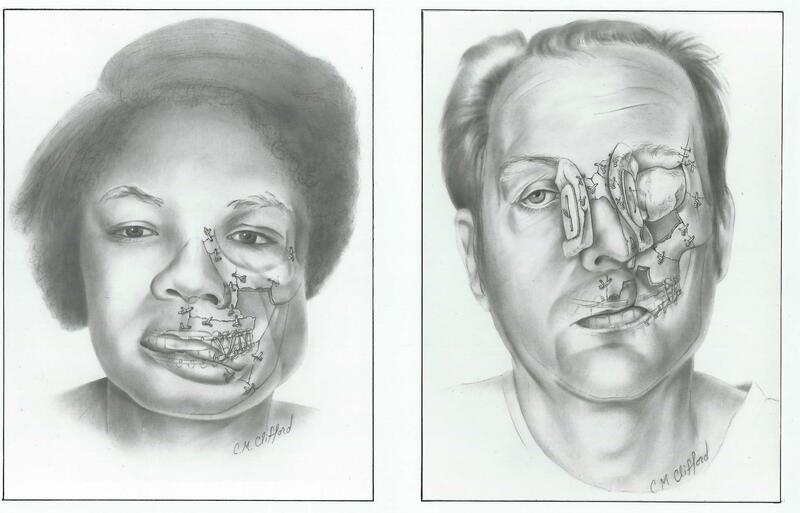 As a medical illustrator in the field of maxillofacial plastic and reconstructive surgery I concentrated on the surgical repair of the face and skull resulting from injuries or birth defects. Injuries were mainly due to trauma from car and bike accidents, fractures to the orbit (eye socket), and gunshot wounds. These injuries, poorly managed, leave a patient horribly disfigured. Surgical repair restores their image and ability to function in society, essentially their lives. 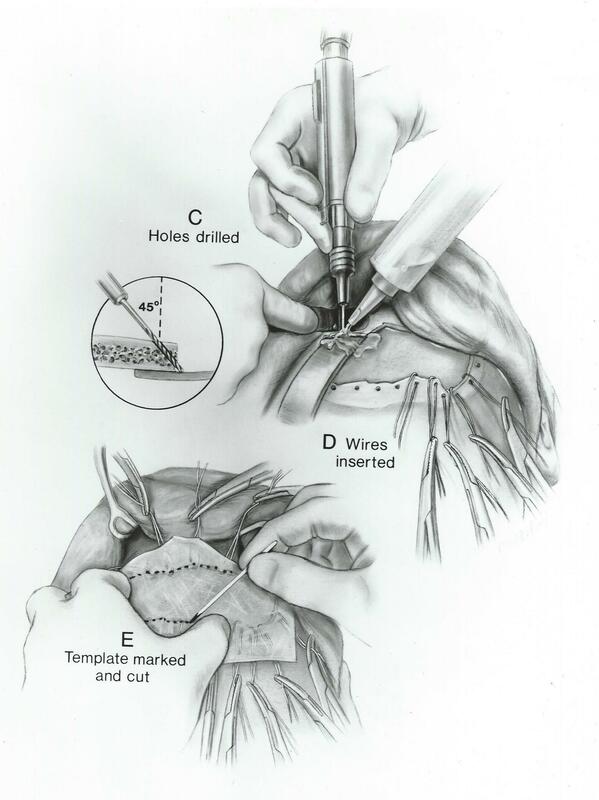 My illustrations taught the surgical techniques pioneered at Johns Hopkins Medical Center in clearly depicted, bloodless, step by step, procedures to other surgeons around the world. 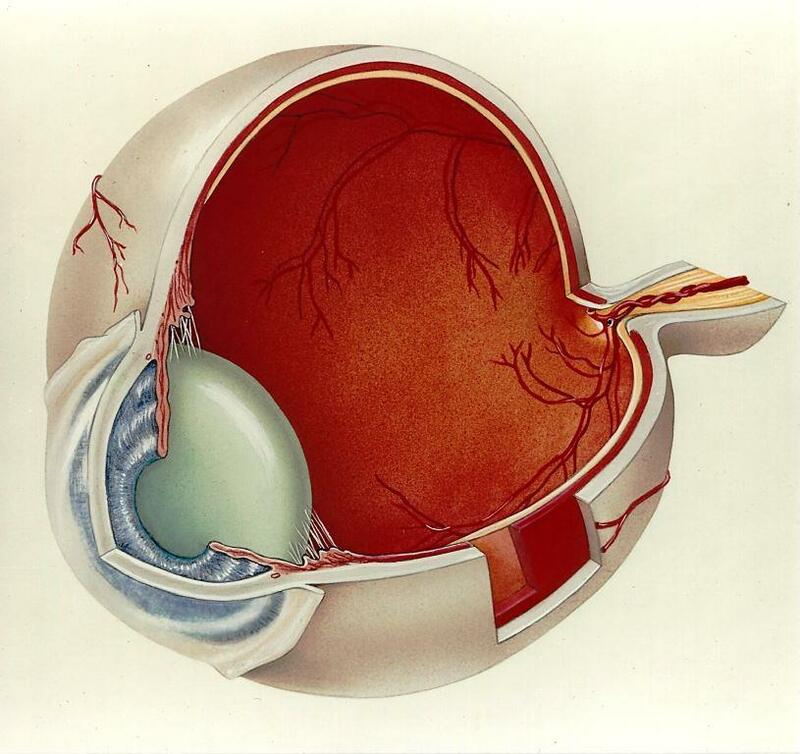 I occasionally branched out into eyes, hands, and general medical/ biological illustration. Carbon dust on calcium board. 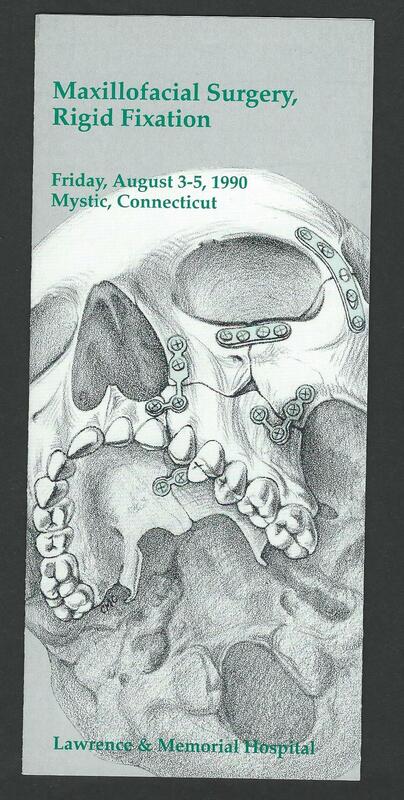 I drew this from a human skull that I had plated with glued-on photocopies of the plates. I penciled the fractures directly onto the skull, so that I could create various fracture and repair patterns by erasing and repositioning plates. Airbrush on photo paper. I made an extremely light print of the previous illustration and airbrushed it to make it full color. Airbrush on illustration board. 3 x 4 1/2 inches. 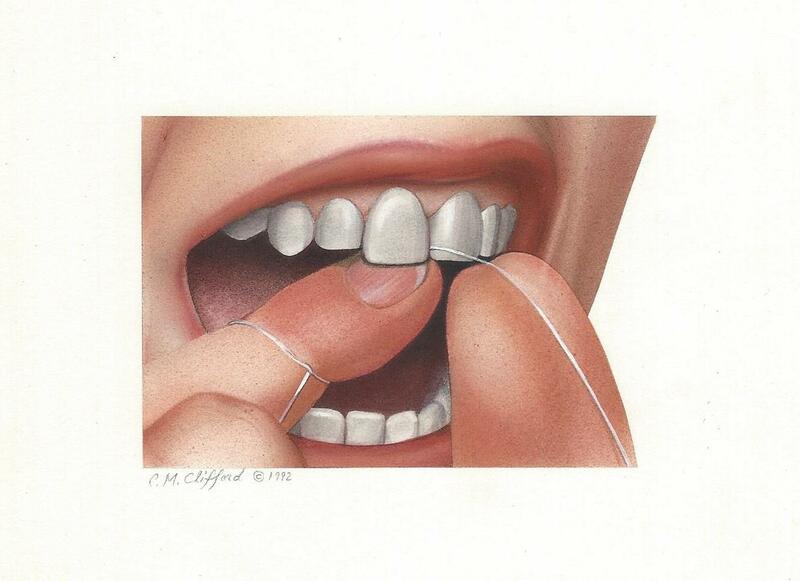 Part of a series on how to floss. 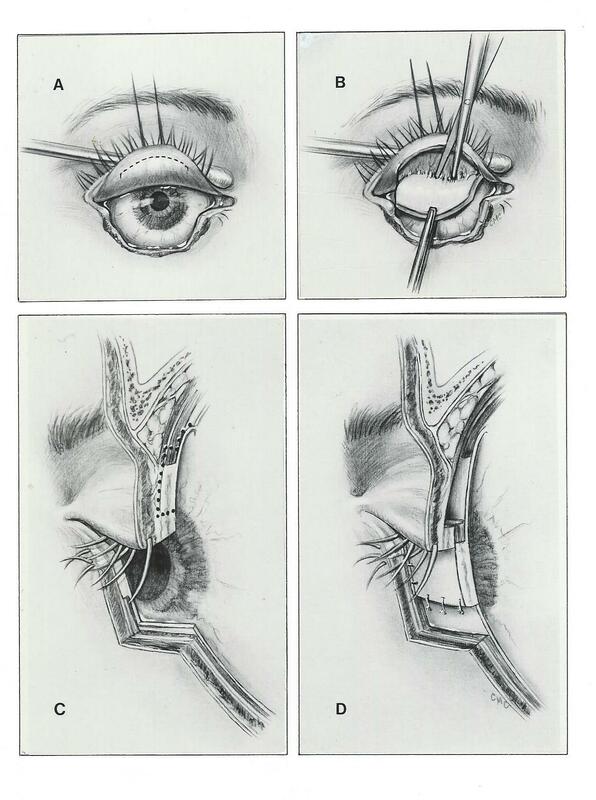 This carbon dust on ledger paper illustration depicts the surgical repair of the lower eyelid. 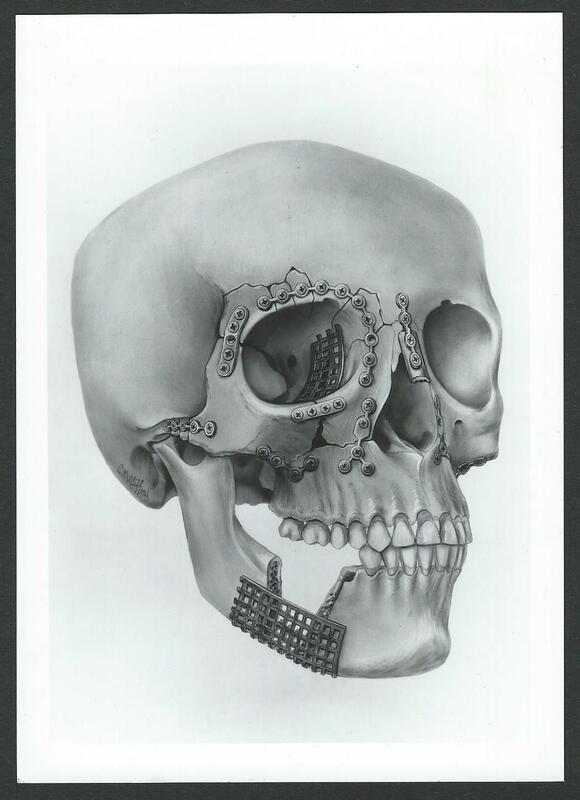 These carbon dust illustrations on calcium board depict internal fixation of fractured bones, external fixation with splints, and how the soft tissue on the skull conforms to the underlying structure. Mixed media on mi tientes paper. The surgeon used this slide in a presentation to teach patient examination techniques. 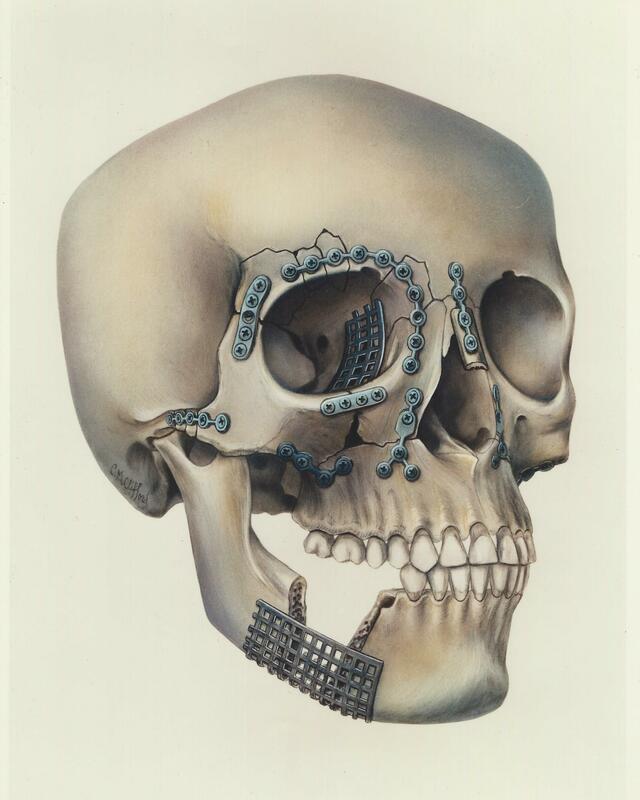 Middle plate of a series designed to teach surgical techniques. I sketched these in the operating room and rendered them later in my office. Carbon dust on calcium board. Carbon dust on ledger paper. I used a co-worker model for the profile and nose drawings. 9x12 inch sheets. Carbon dust on calcium board. 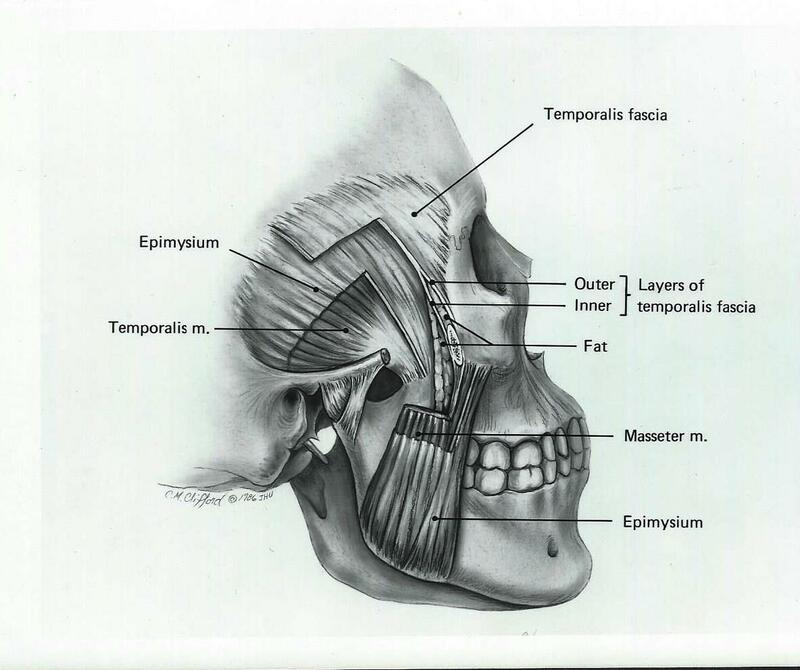 Using the same skull as before and my knowledge of anatomy I created this image to depict these surgically important layers. Black pencil on coquille board. This was the last of a series of brochures I illustrated and designed for the Rigid Fixation Conference. Airbrush and colored pencil on 9x12 inch illustration board. To figure out the perspective of the blood vessels and nerves on the retina, I hollowed out a grapefruit and drew the vessels on the inside of the grapefruit skin with a Sharpie pen. 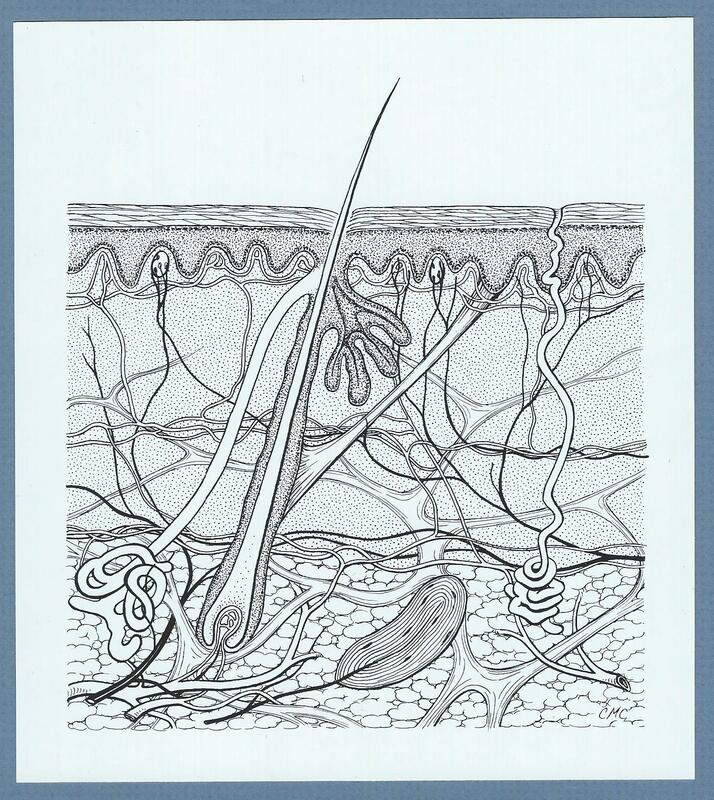 Pen and ink for textbook of the layers of the skin. 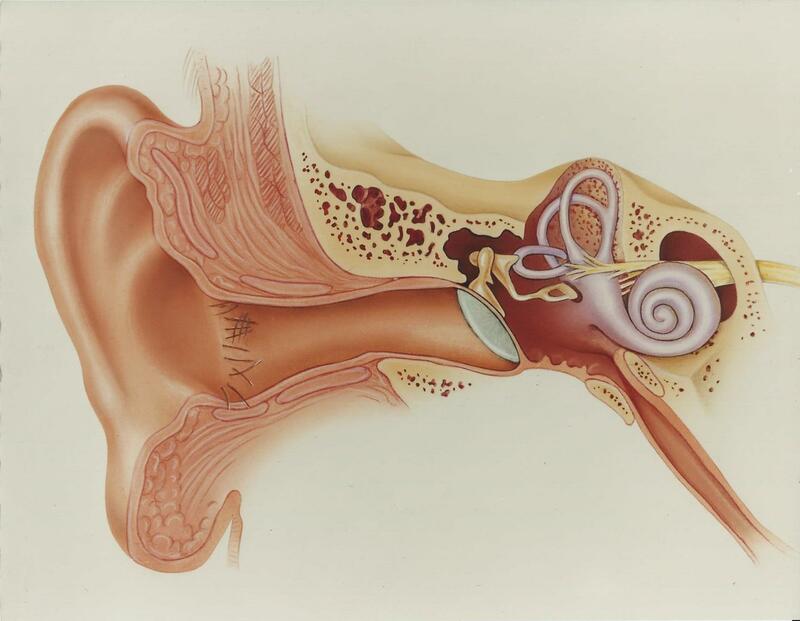 Airbrush on 9x12 inch illustration board of the anatomy of the ear. 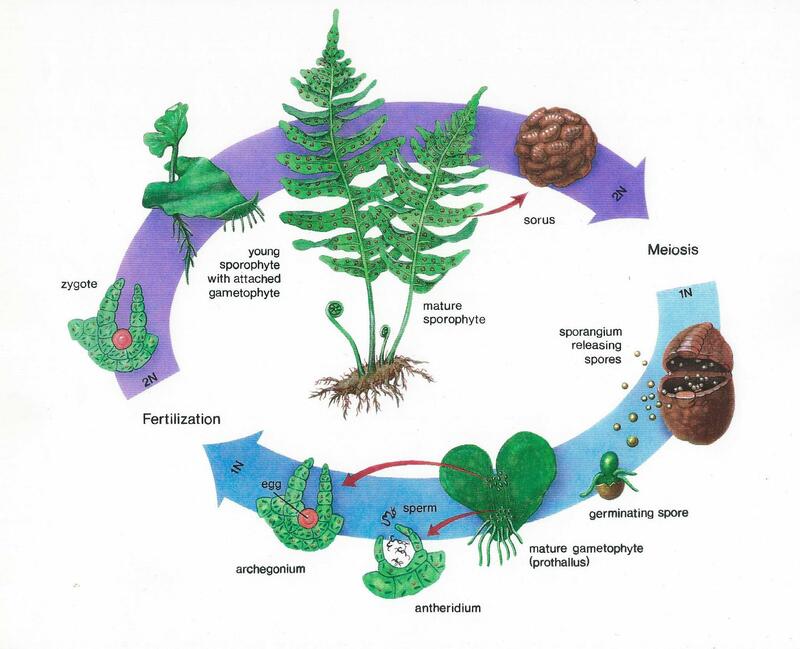 Airbrush on illustration board of the life cycle of the fern. 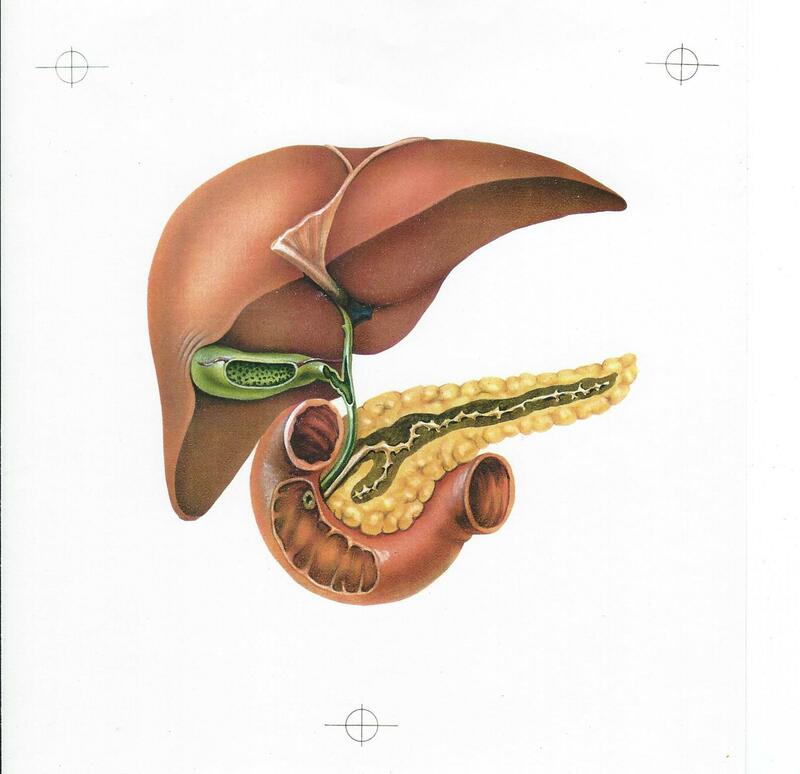 Airbrush on 9x12 inch illustration board of the anatomy of the liver, gallbladder, pancreas, and duodenum. Airbrush on illustration board for textbook. 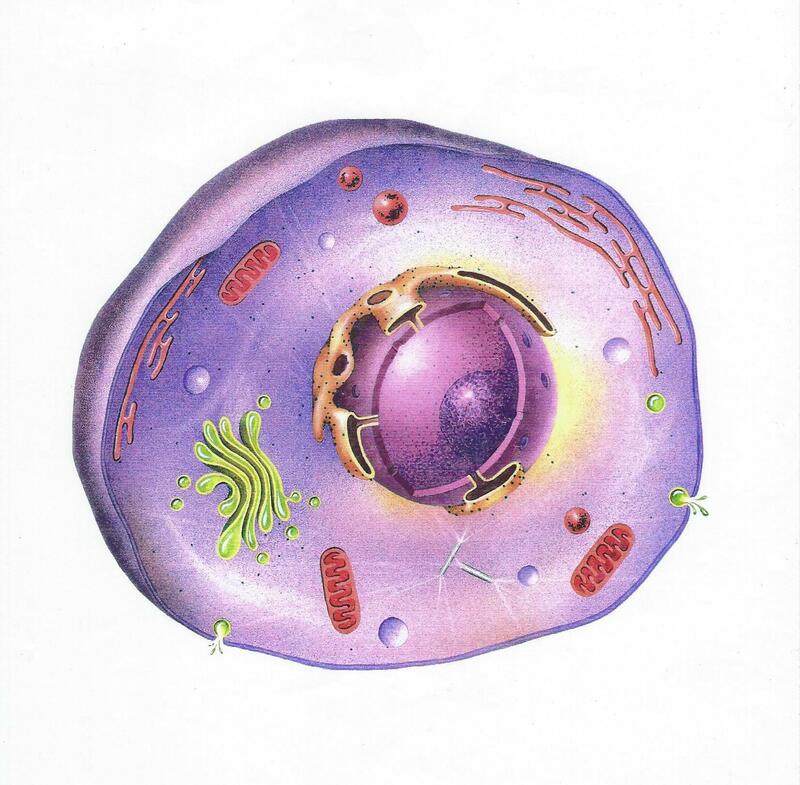 of the animal cell. Pen and ink on Bristol board. 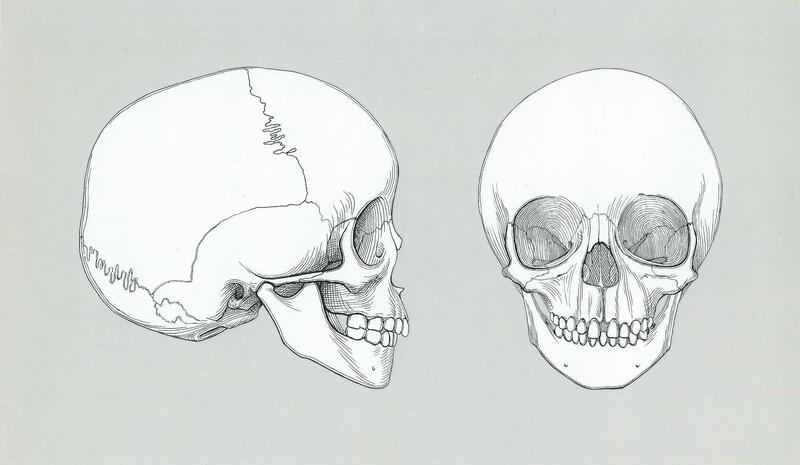 I used a child skull of a four year old for reference in making the drawing.